The Beauty of the Cardstock Stabilizer! Ok, so for starters...what is the cardstock stabilizer? Simply put it is a piece of regular ordinary cardstock that can serve as a "mat" only without the sticky messy adhesive. 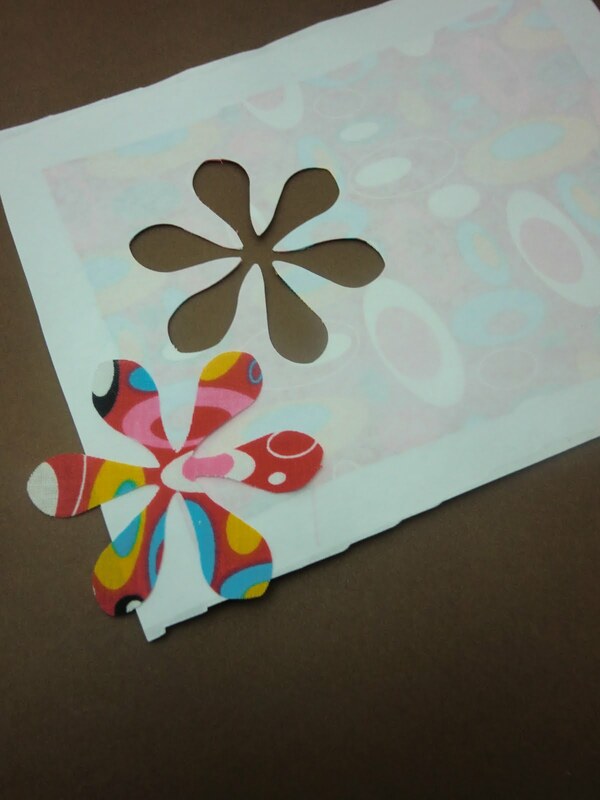 To use it, you simply place the paper that you want to cut on top of the cardstock stabilizer and then feed both papers into the eCraft. Why is this such a beautiful thing? Well so far, I have not found that I need to have any tab settings when using it. That means the cut just falls out of the paper. Check out my video on cutting vellum to see this method in action. I decided to take some of my thinnest patterned papers and see how well they cut with the cardstock stabilizer. I found that all of these papers cut well using a pressure setting of 5. 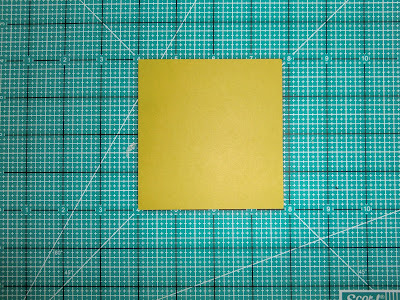 When the cuts are done, you may see an indentation of the blade on the cardstock, but it did not cut through the cardstock at all, so that piece of cardstock can be re-used. Here are some pictures of the papers that I cut using this method. I am going to keep testing out the cardstock stabilizer to see if my theory holds true. If you find an occassion when you have to set tabs when using the cardstock stabilizer, please let me know. So far, it seems like there is no need for tabs when using it, so let's cut away! I want to give another shout out to Nicole at Nick's Cardstock Creations, as far as I know, she was the first to demonstrate this technique! Check out her post about this method HERE. And here is the final result! It worked! I will say this in regards to this method. The cut is very clean, but it is not quite as crisp as when I used the Heat and Bond. There is one petal where at the very top there was a thread that did not get cut, so I will need to trim it out before using it. The other thing to be aware of when doing this is that the fabric will unravel unless you stitch it or use a seam sealing product. I am going to ask my mother what she would recommend, because she is my sewing expert, I don't know enough about it to make a guess. If you use the Heat & Bond you won't have to worry about unraveling. I think everyone is going to have their own preferred method for this, but I for one am excited that I can cut fabric without the adhesive, and I believe my mother the quilter will be too! A new follower asked me a couple of questions, so I thought that it would be a good idea to address it here so that anyone that is new to the eCraft can understand what I am referring to in my posts and on my videos. The first question that she asked was in regards to unbranded cardstock and how the eCraft Settings Chart would work for her. Even if you are not using the name brand paper, if you are somewhat familiar with it, find a paper on the list that is similar to what you are using in terms of density and use that as a starting point. Since I don't know which paper you are referring to, I probably have a pretty good idea of what the paper is like. I would look at the Recollections settings as a good starting point. From there, test out your paper similar to how I am testing the papers here. Even if the paper that you are using is listed, it is always advisable to make a test cut because there are so many factors that can affect how well a paper will cut. The next question that was asked was in regards to the tabs, and she hadn't seen anything like it on the Slice or the CraftRobo. So here is my explanation of the eCraft and how it is different from any other cutting system out there. The eCraft does not use a mat. All the cutting systems that I am aware of use some sort of mat to hold the paper in place while the machine is cutting. The Slice for example uses a glass mat that you have to apply an adhesive to, and the Craft Robo has a sticky mat that you stick your paper to and then load the mat. So how does the eCraft hold the paper in place? The eCraft uses a roller system. When you insert your paper there is a roller above your paper and below your paper. These rollers hold the paper in place while the machine is cutting so that the paper doesn't travel. Since the eCraft has this roller system, the engineers at Craftwell had to come up with a way for the cut image to be held to the paper so that the cut piece doesn't get caught up in the rollers. The solution for this was the tabs. You can program the machine as to how often these tabs occur (tab density) and how big the tabs are (tab width). 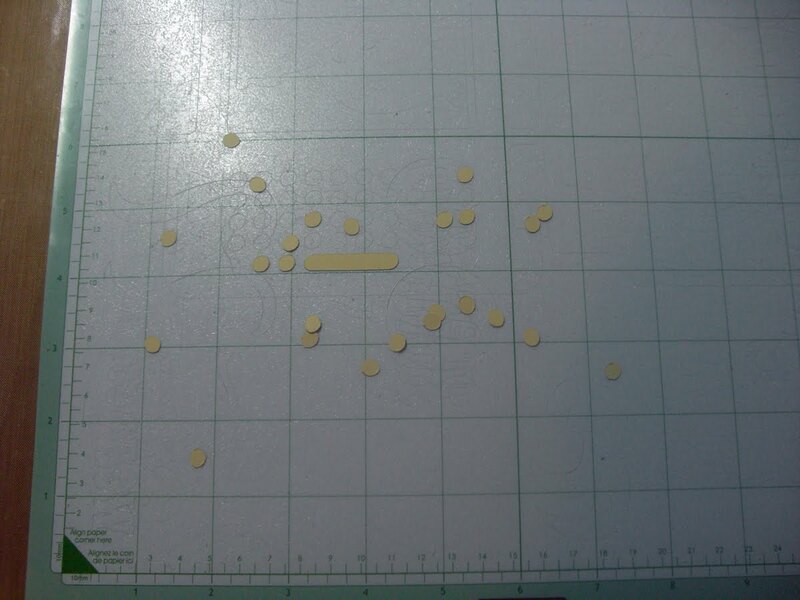 Once you cut your design and remove the paper from the machine, these tabs are all that is holding your cut to the paper. In most cases, the cut will pop out of the paper. Sometimes you may have to work it a little to get these tabs to release the cut, but I have found that this is most likely to happen with intricate shapes such as flourishes that have swirls. Sometimes the tabs may be visible after removing from the paper. In this case, you can sand them down or snip them off. So what is the advantage of the tabs over using the mats? There are three that I have found. The first is purely economical. If you are using the sticky mats, they either have to be replaced or "re-stickied" occasionally. These mats can be quite expensive to replace. I have a Cricut Expression and a pack of 2 mats would run anywhere from $10-13. I did make a habit of "re-sticking" my mats. This did cost some money to pay for the adhesive and then it also took some time to do it. The second advantage is removing the cuts. When using a sticky mat, you have to pry the cuts off the mat with a spatula tool, and occasionally you will have trouble removing a cut and it will tear, so then you have to start all over again. The third advantage is that the sticky mat is just cumbersome. It can be a challenge to keep it clean, and you have to store them somewhere so that they are accessible. Before I had the eCraft, whenever I wanted to make a cut, I found myself thinking about how much I wanted that cut. The reason for that is because of the mats, I just did not like dealing with them. If you are in the market for an electronic die cutting machine, there is something else that I think you should consider before making your decision. Is this system cartridge based? I will refer to the Cricut Expression because it is the die cutter that I am most familiar with. Provo Craft (Cricut) has made all Cricut products cartridge based. What this means is that you need to buy their cartridges to have designs to cut. Because of this you are limited to the cuts available on the cartridges and by the cartridges that you own. If you are considering a cartridge based system, look at the available cartridges and make sure that the "feel" of these cartridges matches your style. If you do not like the cuts available on these cartridges, then you should not buy that die cutting machine. The good news is that there are other options for these systems, even though the manufacturers won't tell you about them. In regards to the Cricut, there are two software programs available (made by non-Provo Craft companies) that will allow you to cut True Type fonts (thousands available for free) as well as SVG files (scalable vector graphics files). There are also thousands of SVG files available online for free. The two programs that I am familiar with are Sure Cuts A Lot and Make The Cut. I recommend Make the Cut over Sure Cuts A Lot. The catch with these programs is that if you use them, the manufacturer's will void your warranty. I am not convinced that the manufacturer would even know if you did or not, but you should be aware of that. What the eCraft is doing that is different from other cutting systems is that it is not strictly cartridge based. The eCraft has SD cards with designs available on them, but you are not limited to those SD cards. The eCraft also has software that will allow you to cut True Type Fonts and SVG files, and that software is from Craftwell the makers of the eCraft. So no worries about voiding your warranty. The other thing that Craftwell is doing is eCraftCentral.com (not available yet). From what I have heard, this website will allow you to view the images available on the SD cards and will allow you to purchase these images individually. That means that if you like a cut on an SD card, you will not have to buy the entire SD card, you would have the option of buying only that image. Supposedly, there will also be the possibility for you to put your designs on the site so that other users can purchase them, and you could make some money from your hard work. Craftwell also has announced that there will be an iPhone, iPod Touch, iPad application that is will also you to design on the go. I should point out that the software, the website, and the app, are not available yet. I have only seen demos of these products and have not used them yet myself, so I cannot at this point say how well they work. Once these products become available to me, I will report my findings here on my blog. Another thing that you should consider is the company behind the cutter. Craftwell is new to the electronic die cutter market, and that has its advantages and disadvantages. The disadvantage is the unknown. Can they compete against the other more established companies out there, and will they make enough money on the products so that they have the money to re-invest and make improvements to existing products and develop new products? The advantage (and ultimately the reason why I decided to buy) is that Craftwell really wants to make a great product. They have postponed the release of the eCraft because of the feedback that they received from the beta testers. They did not want to put an inferior product out on the market, and get a poor reputation because of it. They decided that it was better to wait and make it great before releasing it. They also have been really responsive to the consumers out there. I have written about how I sent Craftwell an e-mail on a Sunday before I made the decision to buy with some questions, and just a few hours later I received an e-mail back from the Vice President. I was truly shocked, and great customer service is a huge plus to me. I again will refer to Provo Craft, because I am more familiar with them. Last fall they released a product called the Gypsy. The Gypsy is a handheld device that allows you to design your cuts (using only their cartridges) on the go. The Gypsy was released with a lot of fanfare. I actually was not going to get one, and then I ended up winning one in a contest, so I got one of the very first Gypsys. The Gypsy was overpriced right out of the gate at $299, and it was filled with problems. I found it had fewer features than their computer software Design Studio (which was not a great program, and in fact their consumers have been screaming for certain things to be fixed on it and it has not happened yet). Just recently, through various updates, the Gypsy is now similar to Design Studio. Also interesting to note, is that recently people can get the Gypsy for $99 or less! I mention this because Provo Craft had to know that the Gypsy was not a great product when they released it, but they released it anyway. Then after all the complaints, why did it take over 6 months for them to fix it? My guess is that if they had waited to release it until all of these problems were solved, they would have been better off. The price of the product alone would not have plummeted, and they would have most likely sold more units because word of mouth advertising is not only the best advertising out there, but it also doesn't cost them anything! In closing, every crafter is different and has different needs. I am not going to tell you which machine you should buy, but I will advise you to look at it closely. I decided to take a gamble when I pre-ordered the eCraft because based on the information I had, I felt it would be the best choice for me. I like to deal with companies that care about their products and their customers. I like the idea of not having a mat. I like the idea of being able to purchase only the images that I want. I like the idea that the company making the product actually encourages us crafters to expand and grow with their product by offering us options beyond their SD cards. Do I like my Cricut Expression? I do, it has worked well for me. Will I buy another Cricut Expression when mine breaks? I don't know yet. Whatever decision you make, make sure that it is the right decision for you. On another note: Tom Meeks over at the Create and Cut Blog has made another great discovery about tab density. Check out his post HERE, and if you are not following his blog, you really should as I have found his unique perspective to be invaluable. I would not understand the eCraft nearly as well as I do without his contributions! Thank you Tom for all you have done, and I look forward to going to your blog everyday! Thanks to everyone who made it through this rather long post! I will have some more results to share you with tomorrow! Hi everybody...this is my 2nd post of the day so make sure you scroll down to see my earlier post. I have added a page now where you can download the eCraft Settings Chart. This will be an ongoing project to update this so check back often. I want to thank Julie who has already contributed several settings for me to add to the chart. If you are an eCraft user and have some information to share, please e-mail me at Denise@PurplePaperParadise.com so that I can include this information. You can access the chart by clicking on the page titled eCraft Settings Chart on my sidebar. Please read through all of the information on the page as there are some really good tips and tricks listed there, and I will update that as we all get more experience with the machine. I have also added a page called eCraft Videos. This is a master list of the videos that I have made using the eCraft so if you want to see one of my videos again, you can go there to find the exact one that you want. More eCraft Results and another Video! I decided to try cutting some thinner papers. I first opened up a paper stack by Me & My Big Ideas. This stack is a black and white stack with smooth patterned papers, as well as flocked papers and a few transparencies. 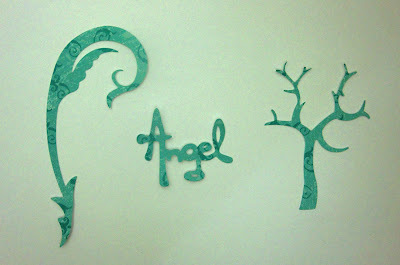 Here are the results from cutting these papers in the eCraft. 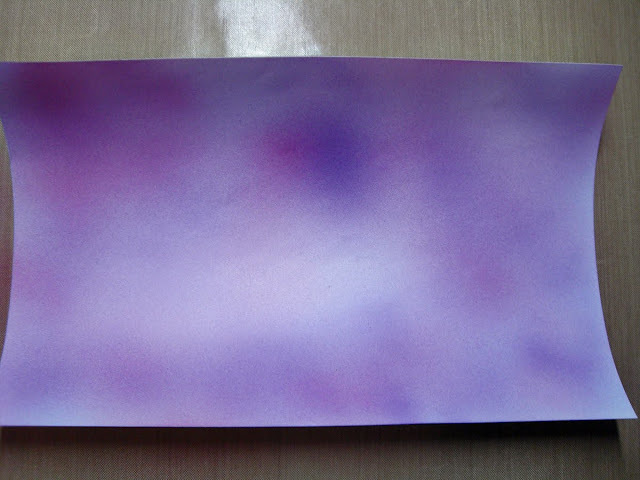 I have not tested the transparencies yet because I want to get some more blades in stock before testing just in case, but here are the results for the other papers in this stack. First off the smooth patterned papers. This paper cut easily and popped out without a problem. I used a pressure of 6, tab density of 1, and tab width of 1. Next up was the flocked paper. I only cut one image from this paper as the flocking did leave behind some debris and I did not want the mess on my hands. 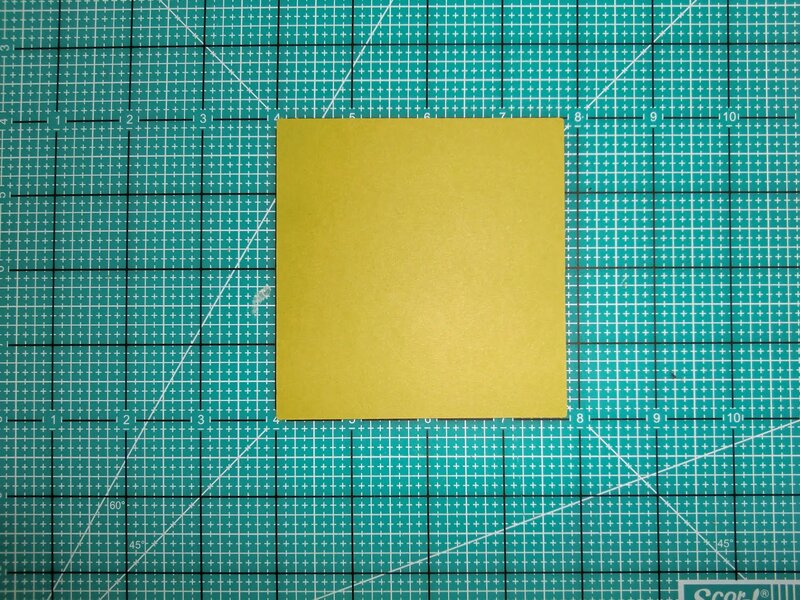 To cut the flocked paper I used a pressure of 7, tab density of 1 and a tab width of 1. The cuts were a little more difficult to remove from the paper, but not so much that I would avoid using this paper. 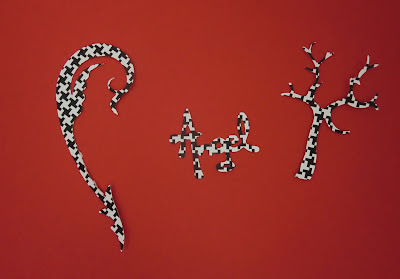 In this image, the black parts are the flocked parts, and the white is smooth. I also decided to test out some Recollections Cardstock. Tom over at Create and Cut, had tested this paper as well using colors from different color collections, you can see his post on that HERE. I used paper from the Primary Color Collection, and I had some interesting results. The cuts cut OK using a pressure of 6, tab density of 1, tab width of 1. The green paper shown in the pictures below is using this setting. One thing that I noticed on Craftwell's Tips & Tricks page was that pressure settings can be adjusted every half step. So I decided that with this paper, I would try it. I put the pressure dial so that the dot in between the 6 and 7 were showing and attempted some more cuts. 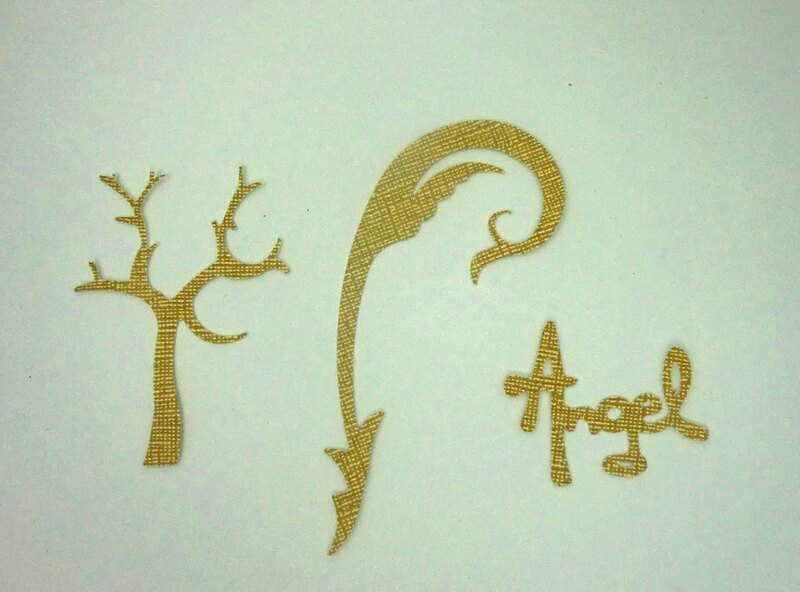 I had some failure here, which I have shown in the picture below, but some cuts turned out better. When using this paper, you may want to try the 6.5 pressure first, and if it doesn't work then knock it down to 6 and try again. 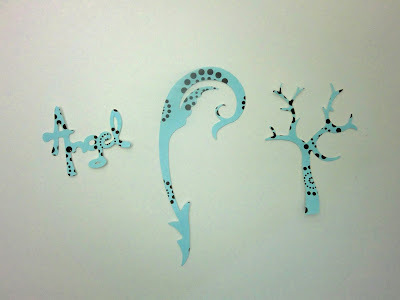 I made another discovery yesterday thanks to Nicole at Nicki's Cardstock Creations. She did a video demonstrating how you can use a cardstock stabilizer on thinner papers and set your tabs to 0. Since the cardstock stabilizer is "holding" your paper, there is no need to have the tabs. This is a great find indeed! In fact, I think that when I am working on a project I will probably consider using thinner papers for these intricate cuts first. Check out her amazing video on her blog HERE. I decided that with this discovery, I was ready to tackle vellum and guess what? It worked great, so I made a video of that for you here. I used a pressure setting of 4, with tab density set at 0. On a more personal note...tomorrow my husband is going to the hospital to have a discogram performed. He has been battling a back injury for almost a year and a half now. We have exhausted all non-surgical options, and now surgery is the only option. This discogram will let the surgeon know if surgery is an option for him and if surgery would relieve him of his pain. He is very nervous about this and we are praying that surgery is an option and that it will relieve his pain as his quality of life with this injury is horrible. Because of this I may not be able to do as much testing over the next couple of days as I would like to. Thank you for stopping by, and if you are new to my blog, please sign up for my GIVEAWAY! I have been cutting up a storm around here! I have two new videos for you. 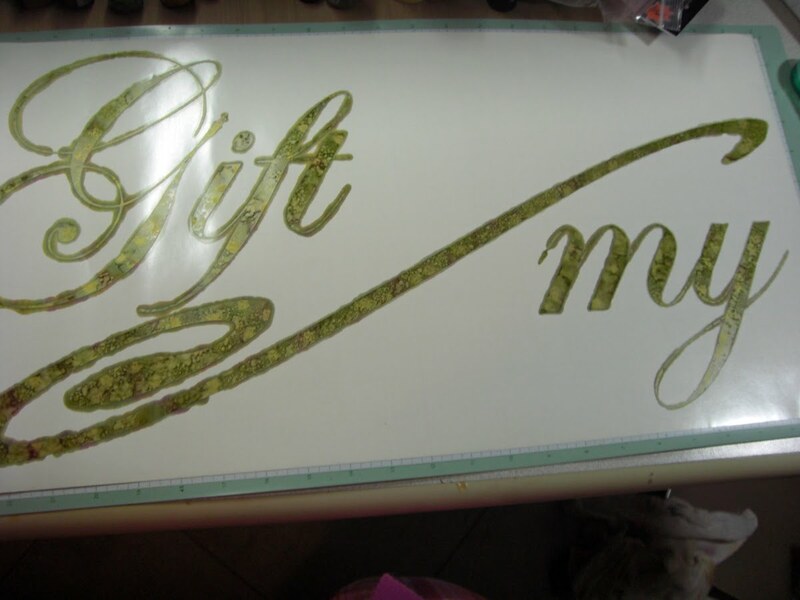 First off, cutting vinyl with the eCraft. 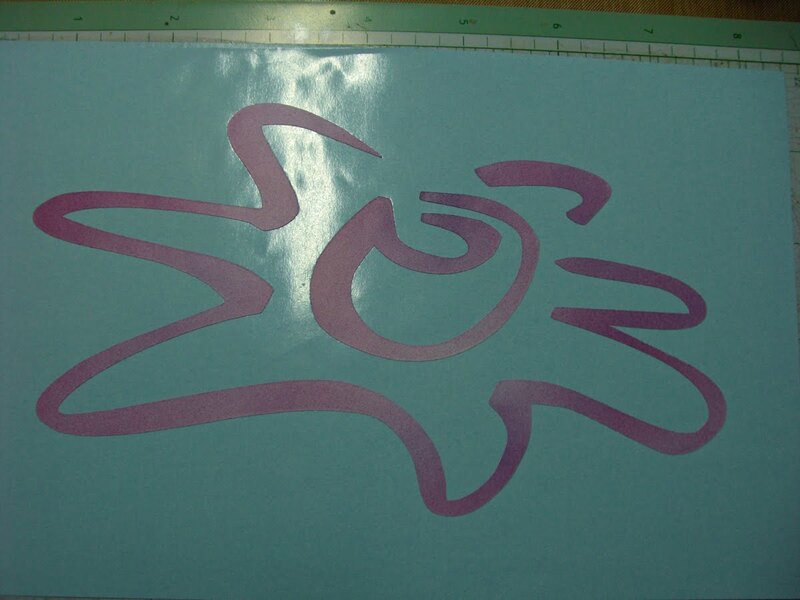 I did this cutting Oracal 631 vinyl, and used a pressure setting of 4, and tab density of 0. Next, I decided to see if I could cut some fabric! It went great, I am very happy with the results! The key to doing this is to apply Heat and Bond Ultahold Iron On Adhesive to the back of your fabric. Other iron on adhesives may work as well, but I did not test any other after realizing that this one worked! Remove the backing paper. 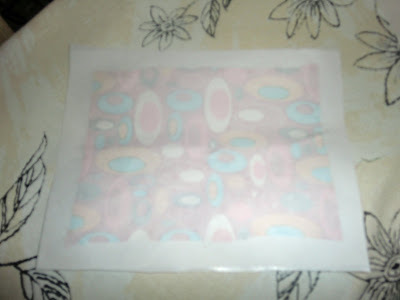 Put your fabric (Heat and Bond side down) on top of a piece of cardstock. Load into the eCraft. I used a pressure setting of 8, and tab density of 0. Here is the video demonstrating this. 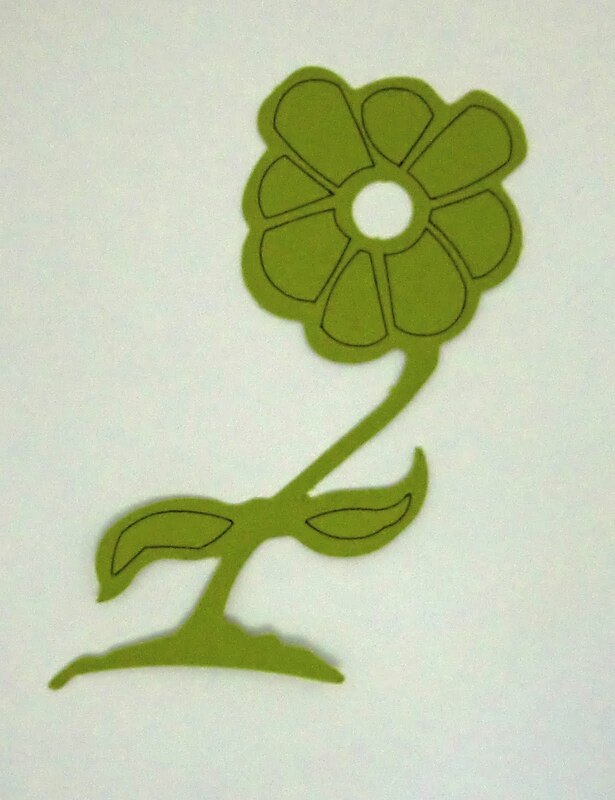 Here is a picture of some of the flowers that I cut using this method. I have more results that I will share with you tomorrow. I am also planning on launching the eCraft Settings Chart tomorrow as well! If you are new to my blog, check out the GIVEAWAY! I spent quite a bit of time last night experimenting with some more papers with mostly good results. My video camera is acting a little finicky right now (think I figured out what is wrong), so no video on these cuts, but I have several pictures to share with all of you. 1st Paper - Core'dinations ColorCore (Super Assortment Nostalgia Paper Pack) Got VERY nice cuts with this paper. I would have to say that this paper cut better than previously tested papers. 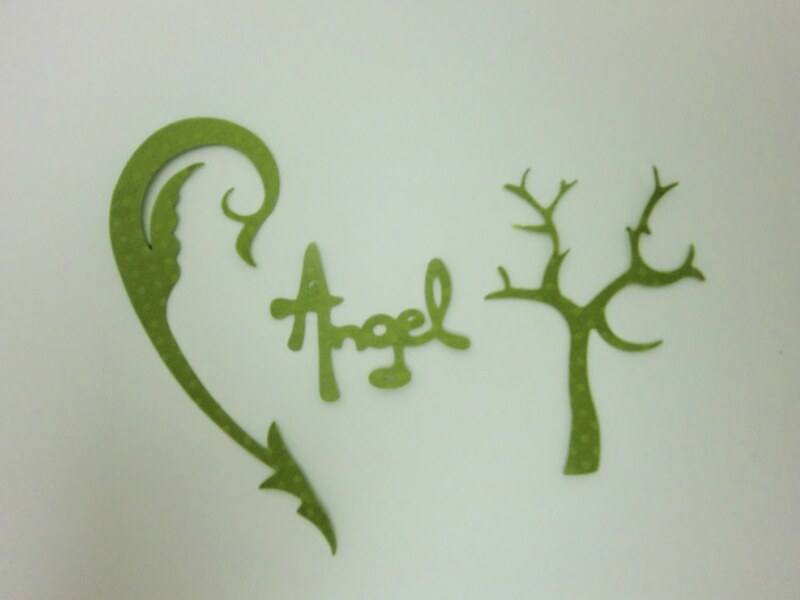 The cuts from this paper also popped out easier after cutting. I used a pressure of 8, tab density 1, tab width 1. 2nd Paper - Core'dinations Vintage Collection (Flower Power Paper Pack). 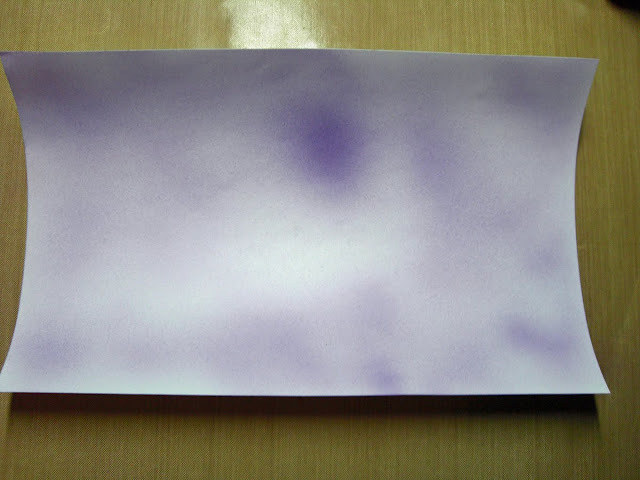 I was curious if I would get the same results with this as the texture on this paper is different. I got the same results with this paper as well. Pressure 8, tab density 1, tab width 1. 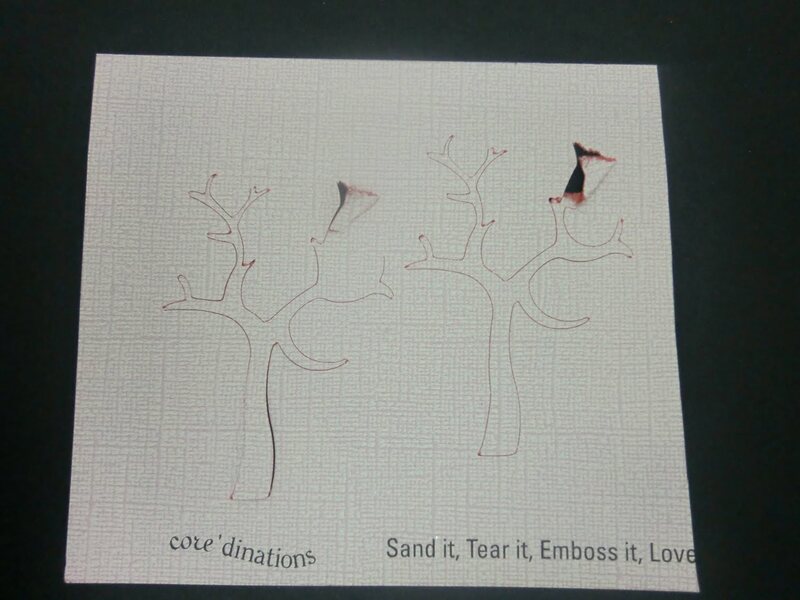 3rd Paper - Core'dinations Gemstones. This is a gorgeous paper that I bought when I was at CHA and haven't used yet. This paper also cut very well using pressure of 8, tab density 1, tab width 1. 4th Paper - Core'dinations Black Magic (Hocus Pocus Paper Pack). This paper's texture is similar to the ColorCore (Paper #1), so I got the same results with this. Pressure 8, tab density 1, tab width 1. 5th Paper - Core'dinations White Wash. Here is where things got interesting. I got a clean cut using the flourish. 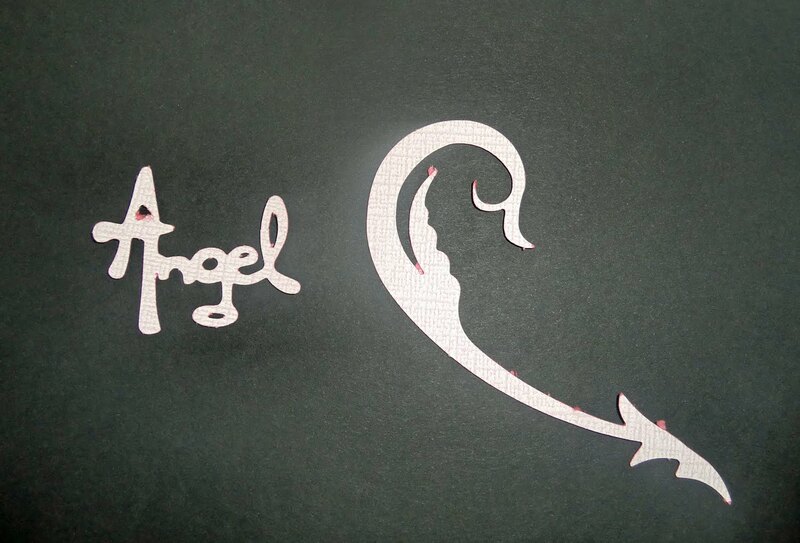 The "Angel" cut was mostly clean although there was a bit of a problem with the interior cut out of the A. When we come to the tree image, I had failure twice with this image. The failure occurred in the exact same spot, but it is not the spot that I have come to expect. I still do not know why this happened. I am probably going to play around with it a little more today and see if I can figure out why. This paper will probably cut well for most shapes. 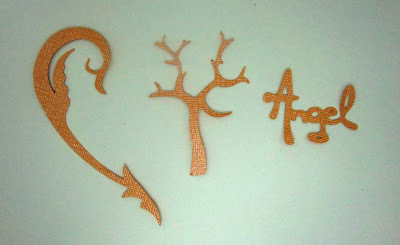 At this point I would not recommend cutting intricate shapes with this paper. I will keep everyone posted if I find a solution to this problem. I used pressure 8, tab density 1, tab width 1 for these cuts. 6th Paper - Bazzill Basics (Tropicals Paper Pack). This paper did not cut quite as well as the Core'dinations papers. The tabs are more noticeable with this paper. While I would hardly call that a failure, it is definitely something to consider as the crafter will need to clean up the image. 7th Paper - Bazzill Basics (Dotted Swiss Paper Pack). I love the look of this paper! This paper was also mostly successful. I used pressure 8, tab density 1, tab width 1 on this paper and got some nice cuts with it. There was some failure on the interior cut out of the A. At this point, I would have to say that if you want to make an intricate cut using this paper, proceed but be prepared that you may need to either clean up the image or there may be failure. 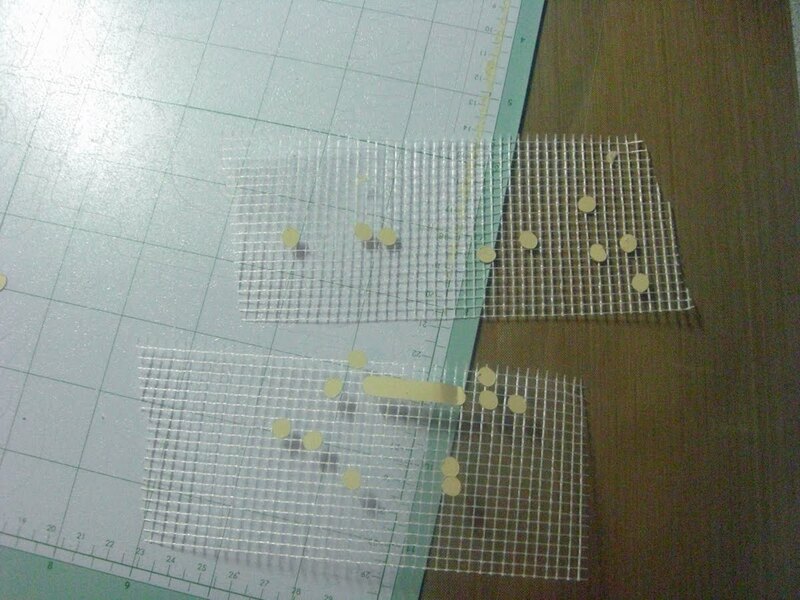 Overall, I had some good results and some not so good (but not horrible) results testing these papers from Core'dinations and Bazzill. Today, I think I am going to put in a new blade and test the Core'dinations White Wash and the Bazzill Dotted Swiss again to see if maybe my blade was simply getting too dull for these papers. I think that new blades might be the key for cutting intricate shapes from certain papers and it just might be good practice to "rotate" blades. What I mean by this, is using new blades for intricate shapes, and using "not quite new" blades for simpler shapes. I have done this with the Cricut in the past as well, so this may be a practice that I will adopt with the eCraft as well. If you are looking to purchase an eCraft (as well as some of these Core'dinations and Bazzill papers), be sure to check out Cutters Creek. Kim Bush is the owner, and I highly recommend her store, she has great customer service and super fast shipping. She also was a beta tester for the eCraft and her insight was invaluable in helping me to make the decision to buy an eCraft. She also runs the eCraft Crafters Yahoo Group and there is a tremendous wealth of information available there. I have only had the eCraft for a day and a half at this point, so I thought that I would share with you my initial impression. The biggest positive to this machine for me is no mats. I can cut these images with little to no prep work, which is great. 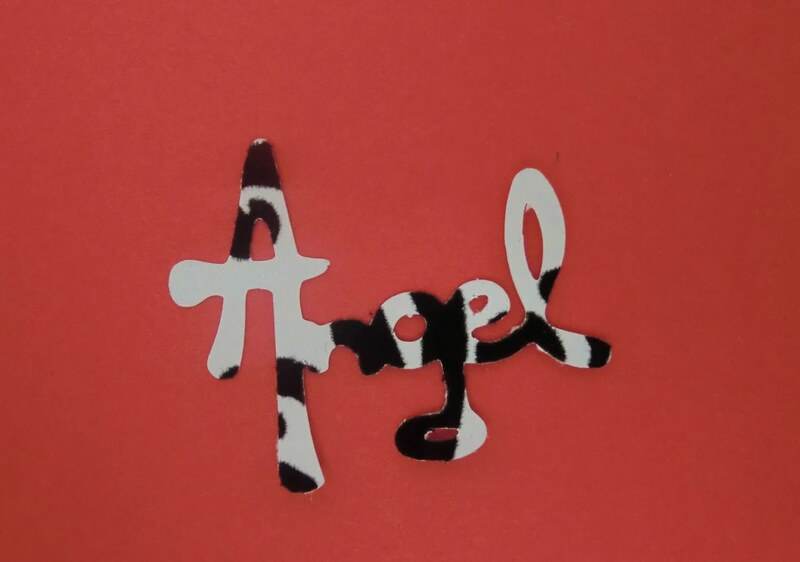 When using my Cricut Expression, whenever I thought about making a cut, I would mentally have to decide if the cut is worth the effort to get out the mat and get everything set up. By eliminating the mat, I am able to be cutting in seconds rather than minutes. While this may not be a big deal to some people, to me it is because I have two little boys and a husband battling a back injury and my crafting time is limited, so I want to make the most of it. The biggest negative to this machine is the noise. It is louder than my Cricut Expression. Last night, my son was playing a computer game while I was cutting out all of these images, and he would complain that he couldn't hear the game. This is not a huge negative to me, because I do have this machine in what we call the "Time Out" room so it is away from the majority of the house. Aside from my crafting supplies, the only other items in this room are my son's computer and the printer. This computer is an old desktop that we let our son use so that he does not use the newer computers in the house, so the only time the eCraft noise will bother anybody is when he is playing his games. Some people may not like the micro tabs that the eCraft produces. I don't mind them. To me, the no mats option is well worth the occasional cut that needs to be cleaned up. With the Cricut Expression I ofter had to clean up cuts anyways so there is really no gain or loss there. There is also something to be said for not having to purchase mats and not having to "re-sticky" mats. Overall, I am very happy with this purchase, but I will be waiting to make a full review of this machine once the software is available. I think the software is what could put this machine on the map as far as electronic die cutting machines go. 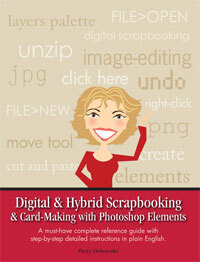 If the software does not meet the needs of most crafters, then the eCraft will not be a huge leap. One thing I do have to say is that Craftwell as a company appears to be very helpful. They want this machine to be well received and they seem to want to make the eCraft everything it can possibly be. So as problems or issues arise, I am going to report my findings to Craftwell in hopes that some of these issues can be corrected. After all they know this machine better than any of us! If you are new to my blog, you can sign up for the GIVEAWAY that I have going on. Also, if anyone has any setting information for the eCraft that they would like for me to include on my upcoming eCraft Settings Chart, please email me at Denise@PurplePaperParadise.com. This chart will be added to my blog here in the next day or two with the settings that I have found thus far and will be regularly updated as I get more information. Thanks for reading this rather long post, and hopefully I will have another video to share with you later today! So the next cardstock that I tested is Stampin' Up. This is an 80 lb cardstock that is very popular in the papercrafting community especially with stampers. I determined that the settings for Stampin' Up cardstock should be pressure 8, tab density 1, tab width 1. 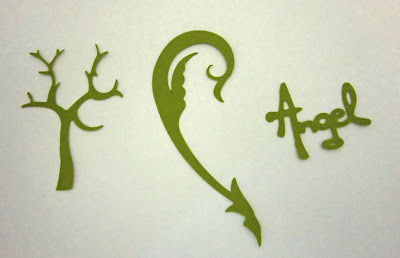 In the video you will see that I had trouble getting this cardstock to cut at first. I took a close look at the machine and removed the blade safety cap and there were a few paper fibers around the base of the blade. I cleaned those up and also made sure that there were none inside the blade safety cap. Once I did that this paper cut great. For future reference, when testing out paper we are going to need to verify that the blade area is clean before determining if there is failure when using a certain paper. Here is the video so you can see what I experienced. 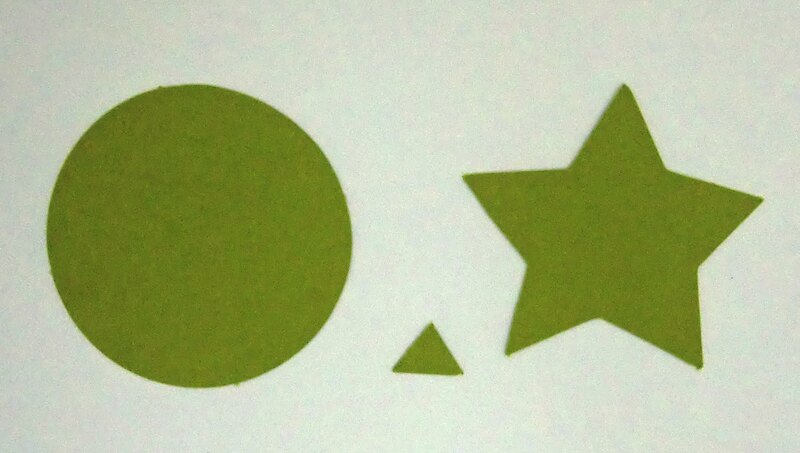 Here are the pictures of the 3 shapes that I cut with the Stampin' Up cardstock. Before I was asked a question (by Cindy) on You Tube about trying to lower the pressures on these papers to see if that would result in better cuts. I did try to cut both the Stampin' Up and the Papertrey Ink cardstock at a pressure of 7 and when I did that the cuts did not go all the way through the paper. The blue light that indicates when a cut is cutting all the way through did not come on at all, so the answer to that question is no. Good thinking Cindy! I am going to post some more videos tomorrow, but I am going to keep it a suprise for now! Make sure you check back, because you won't want to miss it! If you are new to my blog, be sure to sign up for my GIVEAWAY! The eCraft is Here! And so are my first videos of it! My beautiful Purpleberry eCraft arrived yesterday and I could not wait to use it. Unfortunately I had to wait until my kids were in bed, because they just make too much noise! 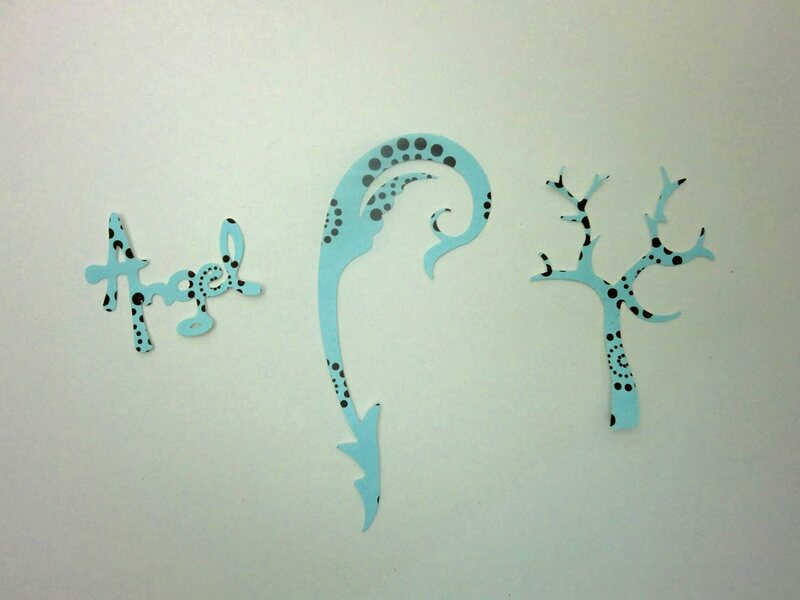 So the first thing that I did was test out the settings for Papertrey Ink Cardstock! The video is in two parts and here they are for you! And here is Part 2! Here are the pictures that I took of the end results. 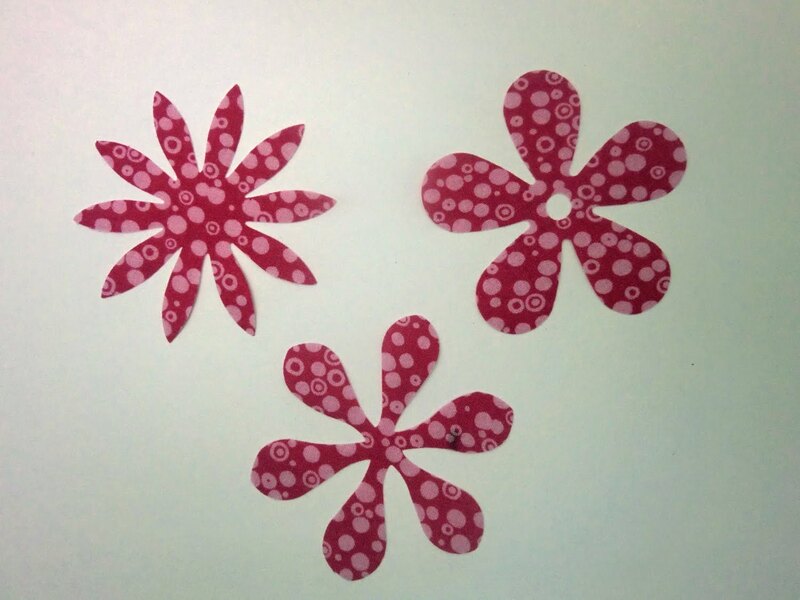 This first one shows 3 shapes that were cut out of Papertrey Ink cardstock using a pressure setting of 8, tab density of 1, and tab width of 1. This is the setting that I would recommend that you start out with. When the software becomes available, I will cut with some more intricate shapes to make sure this is the best one for this paper. Here are some basic shapes that I cut using the Papertrey Ink cardstock and the same settings. The smallest shape here is the triangle which was cut at 1/2", and it cut great. Also I want to point out that the circle is a perfect circle! The Cricut Expression could never cut a perfect circle, but the eCraft can! However, there is an issue that was reported cutting a square on the "eCraft Crafters" Yahoo group, that I had to test out and that had to do with the square. It was reported that squares were not perfect squares. The bigger the square, the greater the difference, so I cut a square at 4" and laid it on my Scor Pal mat so that I could photograph that indeed this is an issue. As you can see the square is definately off. Now in all fairness, we do not know if this is a design issue with the Fundamentals 1 SD card. When the software becomes available, I will try to cut a square using the software and see if we get the same discrepancy. For right now, I am going to assume that the problem is with the SD card and not the machine, but I will keep you posted as to what I find out. 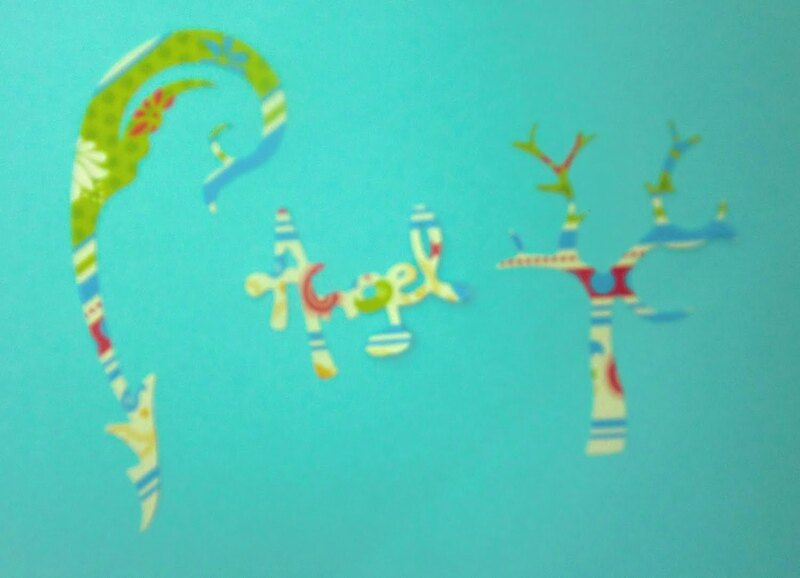 The next thing that I decided to do was cut an image using the pen to see how it works. Here is the cut that I made. I am very happy with the results of this. The pen line is consistent and it is a nice thin line, and it doesn't have any bleeding. This will be nice compared to the pens and markers when using the Cricut, so I think that this is definately a success on Craftwell's part by using a ballpoint pen instead of markers or gel pens. As I mentioned in the video, I am starting an eCraft settings chart showing the settings that I have found to be successful on intricate shapes, and that chart will be posted on my blog here in the next day or two. If you are an eCraft user, please let me know what settings you have found to be successful with which papers so that I can add those to the list. If we all work together on getting this chart completed, that means we can all have more time to play! If you have any suggestions for papers that you would like me to test, please let me know. As always, everyone is welcome to e-mail me at Denise@PurplePaperParadise.com. 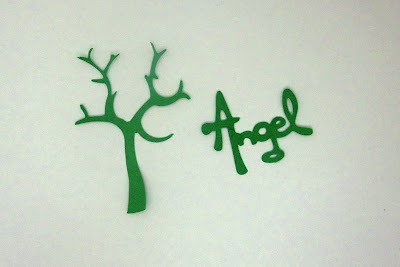 The next video will be testing Stampin' Up cardstock! If you are new to my blog, I have a GIVEAWAY going on right now, so be sure to sign up for it! My eCraft is OFFICIALLY Coming!!! That's right folks! I have a UPS tracking for my eCraft, and it is scheduled to arrive this Thursday! I will start making videos immediately! I want to video the very first cuts that I make so that everyone can learn along with me this machine. That means that everyone will be able to see the positives and negatives right off the bat! I have several different papers that I am going to be test cutting, and can't wait to get started! From various reports that I have read, it seems like the eCraft is going to take some getting used to. With this machine, there are some different settings, and they may be different for each type of paper, so as I go along, I will be making up a list of the tested papers and the settings that I have found work the best from a papercrafter's point of view. Two of these settings involve the "microtabs", one for the width (how big the tab is) and the density (how far apart these tabs are spaced). The process that I will be going through to determine the best settings, is to first determine the pressure as well as the multi cut with a larger tab settings. 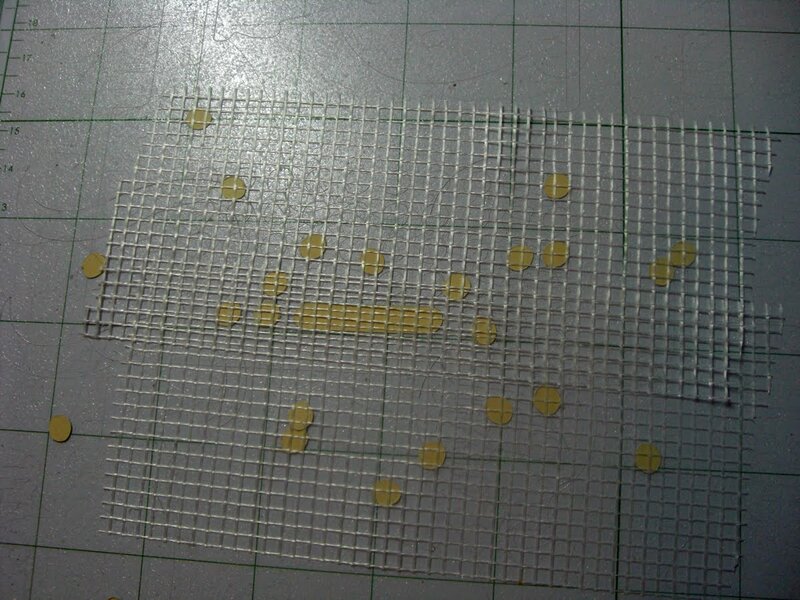 Once we have determined the pressure and multicut, I will then begin to test the tabs by changing one setting at a time until we get the width and density down as small as possible. I will be doing this on at least two intricate shapes at the smallest available size. If I get mixed results on these two images, I will add in more until I can find the settings that will work best with most shapes. Another thing to note is about the paper itself. Tom at Create & Cut noted that he believes that the grain of the paper makes a difference in how successful the cut is. 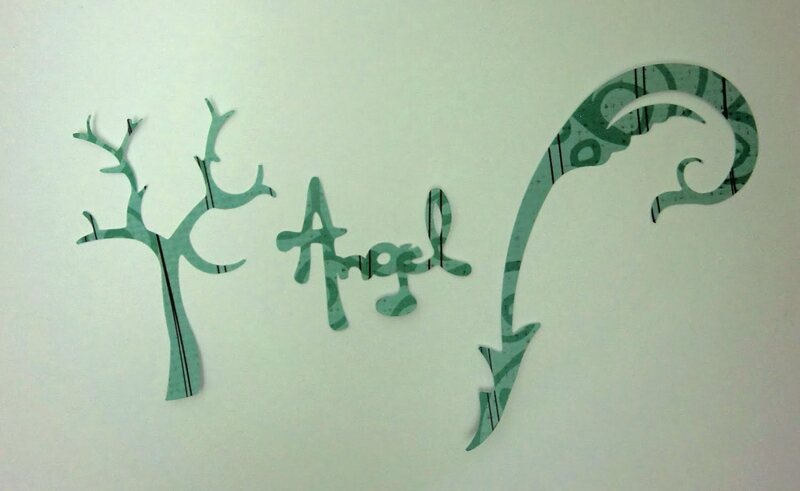 Meaning that we are better off inserting the paper in a certain way to get a succcessful cut. I will be testing this as well, as this is not something that I have ever experienced with electronic die cutters before. Another thing that Tom has noted is that the heavier papers seem to cut better. This is something that I am also going to experiment with, and it is something that will be a bit of challenge. As I am sure most of you know, the "lb" rating on a piece of cardstock is not a very accurate measurement. The reason for this is that the paper gets weighed at 500 sheets before the paper is cut. Why is this important? Because not all cardstock is manufactured at the same size. So in other words, one company makes their "pre-cut" sheets at 17"x22" and another can make theirs at 24"x24". They can both be weighed and have the same weight (or that "lb" rating that we see on the label), and then they are cut into the final product. Since the pre-cut sheets are different, but the weight is the same, our final products will be different. The 24"x24" pre cut paper will be lighter than the smaller pre-cut sheet of 17"x22". To get past this, I will simply have to give you my opinion on which papers are "denser". The first two cardstocks that I plan to test are Papertrey Ink's which is 120 lb and Stampin Up's which is 80 lb. I do notice a difference in these papers and PTI's is definately the heavier paper, but not to the degree that you would think by looking at the pound rating. I believe that we will see that both of these papers will probably be cut at the same settings. When the software is available (ETA September 1st), I will be sharing videos of that as well. With my knowledge of Make the Cut, I hope that I can learn this software fairly quick so that we can fully explore all the options and again note the positives and negatives. I am very excited to get this machine, but I want all of you to know that I will report my findings accurately. I fully expect that the eCraft will have it's flaws and I will point them out to you. While the machine will have flaws, I will also see if I can figure out a way to work around those flaws, and I will also be letting Craftwell know about my findings so that hopefully they can correct these things in future editions of the eCraft or even with a firmware update, or a software update. No machine is perfect right out of the gate. 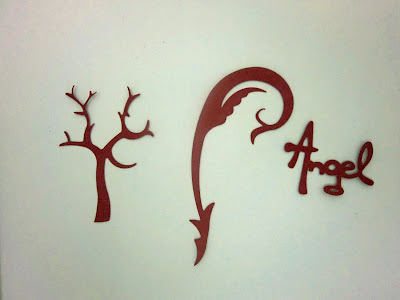 I remember all the issues that I had with my Cricut, and most of those issues still exist, but I have been able to find a way to work around most of them as well. I also want to encourage everyone to ask questions, offer solutions, etc, because I believe that the crafting community is one of the most innovative out there. Individually we all have our strengths and weaknesses, but together we can solve any issues that may come up! I will post the first video on Friday, and I expect that there will be several more after that, so check back often! If you are new to my blog, be sure to check out my GIVEAWAY! Ever since I was a little girl, my mother has been a sewer. She made lots of clothes for me and my brother, and when I was maybe 5 or 6, she took up quilting. Thirty years since she started this new hobby, and she is going strong. She has a talent for choosing colors and patterns that go together, and she is so fast too! My mom is officially retired (has been so for about a year now) and she has been enjoying being able to spend more time quilting. When I was little, she tried to teach me to sew, and it was an utter failure! When I started papercrafting, she proclaimed that she could never do it. I think though that I got my talents from her, we just choose to work with different materials. Since my mom has become Grandma, several of her creations have become gifts for my boys. 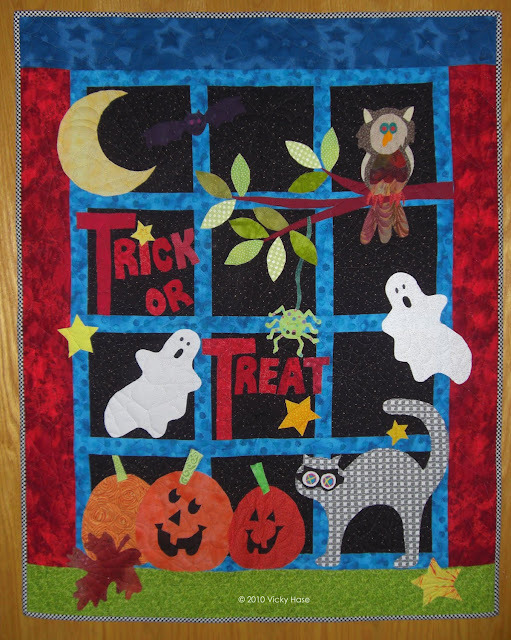 In a few weeks, my parents are going on a month long dream trip throughout Europe, and she wanted to make sure that my kids had these Halloween wallhangings before she left. When I look at her creations, I can see how the shapes and images within each quilt can be turned into papercrafts as well. This first one is the one that she gave to my oldest son Jared. And this next one, is the one that she made for my 2-1/2 yr old Mason. He has been absolutely enamored with it. I hope all of you have enjoyed seeing these creations, they are even more beautiful in person! 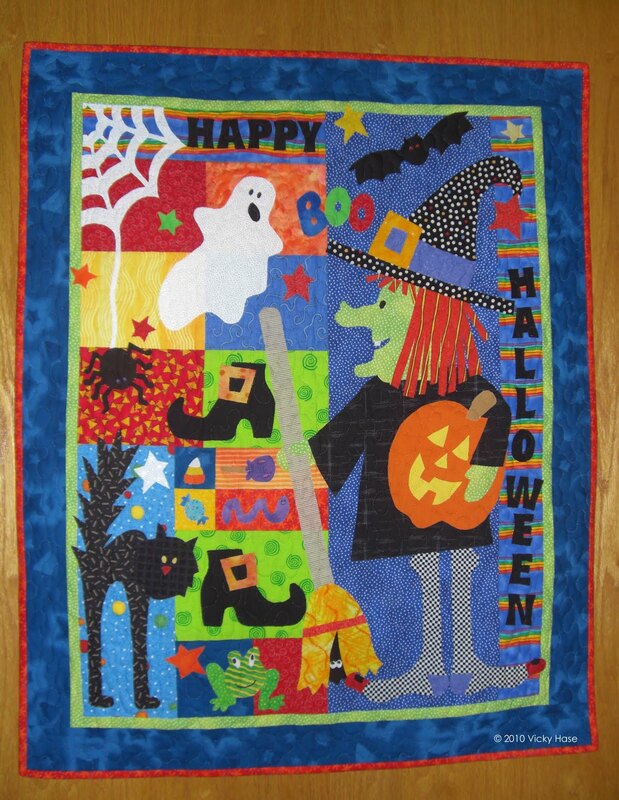 What ideas do you get from these quilts? Please let me know if these have inspired you, I would love to pass on the comments to my mom, and if everyone thinks it worthwhile, I have several more quilts that I can share with you for even more inspiration! P.S. There may be another post later today with some exciting news! Hint Hint! P.P.S. Here is the GIVEAWAY post! It was a crazy weekend around here, and I just barely had enough time to get into my craft room to make this card for my FIL's birthday. I always struggle with cards for men, but the idea for this card hit me like a lightning bolt when I saw this train image at Clearly Vintage. My FIL is a train nut! He has a couple of the trains that you ride on, similar to the one that was in that old TV sitcom, Silver Spoons. One of the trains is at his house. He made tracks and has them in his yard for this train. So when I saw this vintage train image, I just knew that it would go great with Papertrey Ink's Just the Ticket stamp set. This is a great stamp set, because it can be used for just about any occasion, and it also very gender neutral. I used the Color Couture Volume 6 color scheme from PTI as well. These colors are Summer Sunrise (card base, and ink on the hand pointing), Pure Poppy (cardstock layer under train image and star stamps on ticket strip), Hawaiian Shores (ticket outline stamp), Dark Chocolate (sentiments stamps), and Aqua Mist (ticket strip). I also used the Dark Chocolate and Pure Poppy baker's twine. 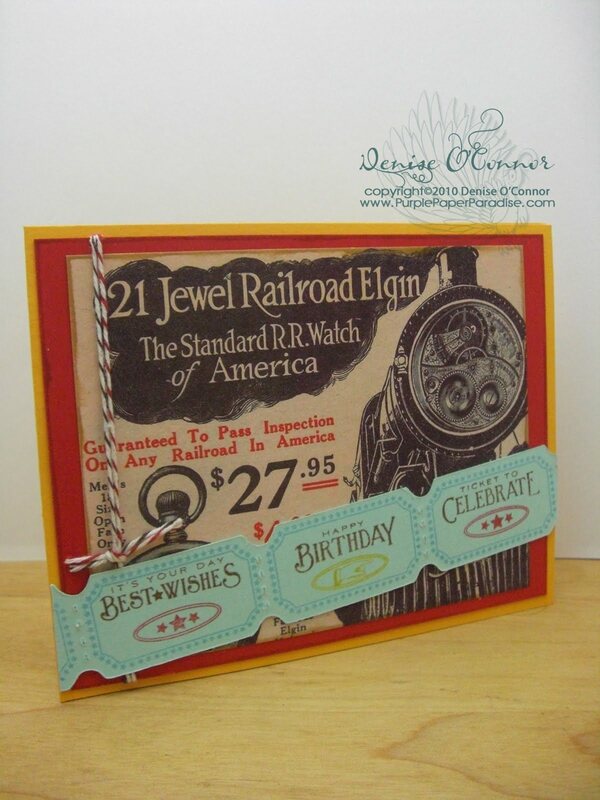 I used the train image as a Digital paper and it worked great, once this was printed and the ticket strip cut out, this card came together so fast! Here is the GIVEAWAY post...don't forget to sign up, there are some great items here! Well I did not make it to the Scrapbook Expo yesterday, and it is not looking good for me getting there today. Oh well, such is life. I have however gotten to Hobby Lobby twice this week, and found something there that I think you all might like. As you may or may not know, I love most of the products that Tim Holtz comes out with. I especially like his rubber stamps, I don't have very many though because they can be quite pricey. 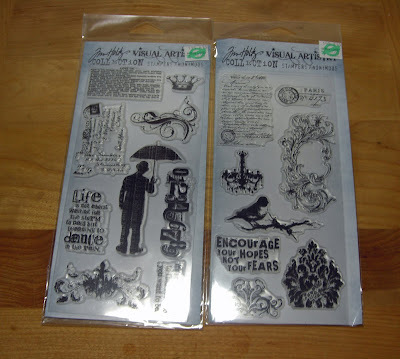 On Monday, I was at Hobby Lobby to get something to complete a project that I will share soon, and I just happened to notice that in the rubber stamping aisle, they set up a little section of Tim Holtz items. There were quite a few things there that they never had before, and my eye was instantly drawn to these. These are acrylic mini sets of some of Tim's most popular stamps priced at $14.99. Using a 40% off coupon got the price down to $8.99 each! Now you know why I went back a 2nd time! The one on the left is called Purely Random and the one on the right is called French Connection. My Hobby Lobby had places set up for 6 of these sets, but unfortunately they only had these 2 in stock. Since not everyone has access to a Hobby Lobby, I went ahead and looked online to see if there are in the online store and they are! Here is a LINK to the online store showing all 6 of these stamp sets! Also you can use your coupons at the online store! The GIVEAWAY is still going on, don't forget to sign up! Well, yesterday I had posted that it was my MIL's birthday and that I was going to go over to her house and put up the vinyl wall art piece that I made for. Unfortunately, my hubby and my FIL were not feeling well and so the birthday celebration has been postponed. We may do a combination birthday celebration because my FIL's birthday is on Tuesday. Since, this happened I was unable to put up her vinyl wall art for her. I was disappointed because I cannot wait to see what it looks like all put together! I thought that for today I would show you the card that I made for my MIL. She doesn't read my blog, so I have no worries about her seeing it before I give it to her. I actually made this card really quick yesterday, because I was not happy with the one that I had previously made, AND I got my Papertrey Ink order from release night. I did not order the All Booked Up stamp set last month when it was released because I was debating if I wanted it. I decided that I definately did want it. I am a huge book reader, and I have been known to give books as presents. My MIL is also a book reader, so I knew that the theme would be great for her as well. For this card, I used the colors from Papertrey Ink Color Couture Volume 2, which are Pure Poppy, Berry Sorbet, Spring Moss, Ripe Avocado, and Vintage Cream. I used the Text Style stamp set in Ripe Avocado ink on Spring Moss, and the same color combination for the circle image from All Booked Up. The frame is from All Booked Up and was stamped in Pure Poppy on Berry Sorbet. The sentiment is from Everyday Button Bits and stamped in Vintage Cream. 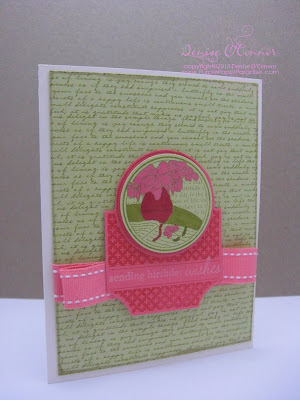 I used a Vintage Cream card base, and also Berry Sorbet saddle stitch ribbon. I used some of my Copics to color in parts of the circle image. Overall I am pretty happy with it, but I think that it could be better, just haven't figured that part out yet. On a side note, I am planning on going to the Scrapbook Expo in St. Charles today. It will all depend on how well my hubby is feeling today and if he thinks he can stay with the kids so I can sneak out for a couple of hours. I may have to go on Saturday instead. Regardless of when I go, I will take pictures of anything that I find interesting and I am sure that I will come home with some goodies too. I have been having some problems with my digital camera, and decided that it is time for a new one. I have had this one for almost three years, so it is probably not worth repairing. I ordered a new camera, and hope to have it Monday or Tuesday, which is perfect timing. My darling son, Jared starts Kindergarten on Wednesday, and of course I have to capture the event in pictures! In the meantime, my old camera still works and I also can use my IPhone if need be, but I really want these pictures to be great. He only starts Kindergarten once! Thanks for visitng me today, and here's the GIVEAWAY! So if you look closely at the second picture, you can see that the ink did bleed into the cut lines into the backing paper. The suprising thing is that the ink did NOT bleed through the backing paper! My Cricut mat is not horribly stained and ruined. I should tell you that I think if I had used more ink, bleed through onto the mat may be the case. I used enough ink to get solid coverage throughout. I did go back through to touch up areas, but only after waiting a few minutes to allow the ink to completely dry. My goal today is to get this wall art piece up on the wall at my MIL's house because her birthday is today! This is her birthday present and I am on pins and needles. I really hope that she likes this. She is a very difficult person to shop for because she buys anything that she thinks she wants! So when it comes to holidays, finding a present is very hard because she already has everything that she wants. In the past, she has responded well to my crafted items, so hopefully she will love this! Thanks for stopping by and wish me luck! Here is the GIVEAWAY post, don't forget to sign up! Back to School/Fall Blog Hop! Quick update for all of you. The Back to School/Fall Blog Hog is being postponed. I will update you as I have more info, but we have some new ideas for a Blog Hop that will be awesome! Also, if anyone would like to participate as a hostess, please send me an e-mail at Denise@PurplePaperParadise.com. This is my 2nd post of the day, so make sure you scroll down to see my earlier post! As you all know by now, I am still waiting for my eCraft. Supposedly, my machine was one of the flown in machines, but apparently they are having some sort of trouble with the Pinc and Purpleberry machines. Of course, I ordered a Purpleberry! So alas I wait! There is some new information however that I can share with you. 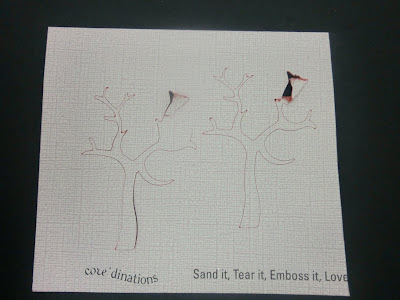 Tom Meeks of the Create and Cut blog, does have an eCraft machine and has been doing some experimenting with it. I have spoken with Tom a few times, and he is a fascinating person and I really thing that everyone can benefit from what he is doing. Tom is NOT a papercrafter. He is what I would call a techy guy. He is looking to take an electronic die cutting machine and use it for some other purposes. He is paticularly interested in 3D projects. He has a different point of view than what most of us would have, because of his inexperience in electronic die cutting and I think we can all learn from him as he learns! I will be checking in with his blog often, and I look forward to getting my machine (hopefully soon) so that Tom and I can compare notes! Thanks to Tom for sharing his learning adventure! Since I have an eCraft on its way, I have been toying with the idea of buying rolls of vinyl instead of the sheets that I normally buy now because the rolls are so much cheaper. I have steered away from buying rolls because buying 1 roll in every color that I want would cost an arm and a leg. Recently I saw a blog post somewhere and unfortunately didn't bookmark it. 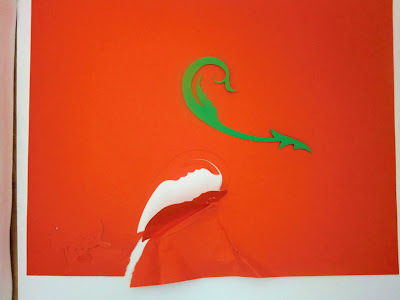 This blogger used THIS method on a piece of vinyl and then cut a shape out of it in her Cricut to apply to a Frisbee. (If you know who this blogger is, please let me know, I would LOVE to thank her for this!) I have used this technique before and love the results, so it got me thinking. This technique uses the Adirondack Alcohol Inks, so what other items out there use alcohol inks? Copics. You have to love the Copic markers. I also happen to have the Copic Airbrush system, so I thought that I could probably airbrush white vinyl. It works like a charm, and the effect is so beautiful! For this example, I used Copic V17 and RV19. First I airbrushed a layer of V17 and here is what it looks like after 1 coat. I then applied a layer of RV19. The inks dry almost instantaneously. By the time I put the markers and the air compressor away, the inks are dry and ready to be cut. I just love the effect that this airbrushed vinyl gives this wall art piece. I think that I can comfortably buy a roll of white vinyl and use this more in the future. 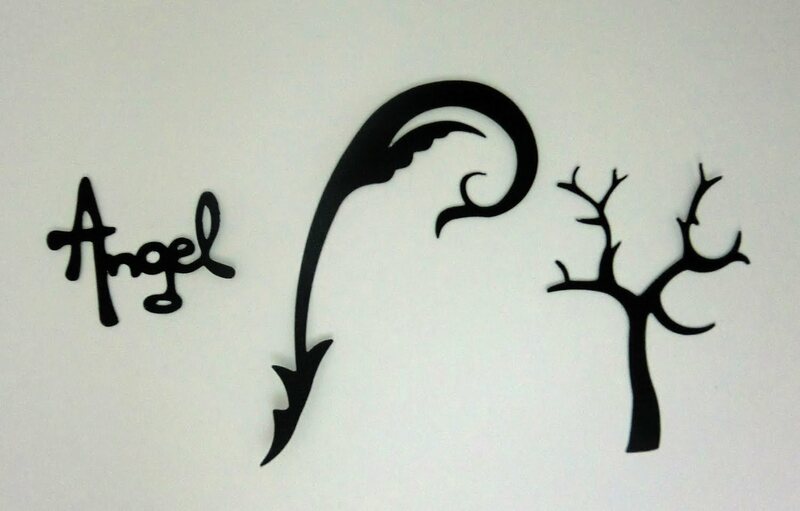 I have a vinyl wall art piece that I am going to make for my MIL as a birthday present, and have been having trouble finding just the right color for it. I will be using this technique for sure on it now! On a side note: I am not in love with the contact paper as a transfer tape. The transfer tape that I have also is not great. If you know of a great transfer tape at a reasonable price, please let me know. I could really use some crafty advice on this! 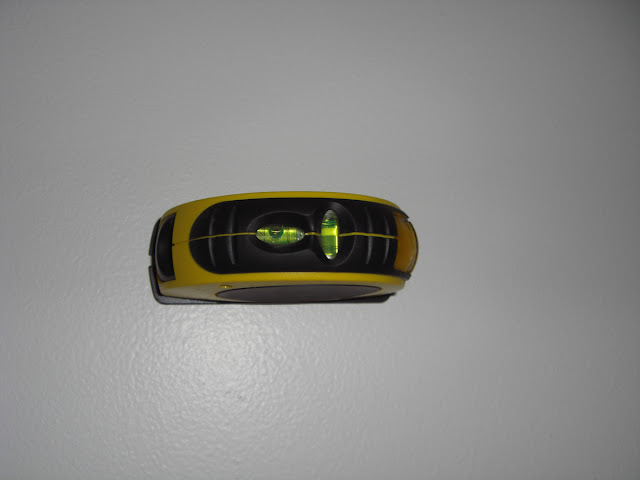 A couple of weeks ago, I was looking through my hubby's tools looking for something and I came across this laser level. I had completely forgotten that he had it, and to my knowledge, I don't think he ever really used it. So I snatched it! I decided that this would be perfect to make sure that my vinyl lettering was straight. I do not do well with eye balling this kind of thing! After looking at this particular model, there are two pins that eject from the base and those pins go into the wall to hold it in place. I tested this in a closet because I wanted to see the holes that were left behind. 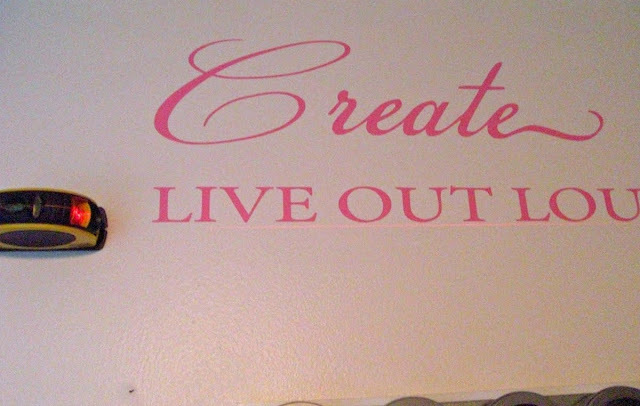 I was right to do this, because these holes are noticeable, and when next to a wall art piece, they would bother me. I don't know if this is how all laser levels work, but I certainly did not want to spend money on another. So I had to come up with a different method. I found some Picture Hanging Strips made by 3M with the Command adhesive. This is the same adhesive that is used on those hooks where you just pull down on the tab and it releases cleanly from the wall. The Picture Hanging Strips are different in that there is no hook, each piece is like a piece of plastic Velcro. They are used so that you can hang pictures on the wall by attaching the strips onto the back of the picture frame. 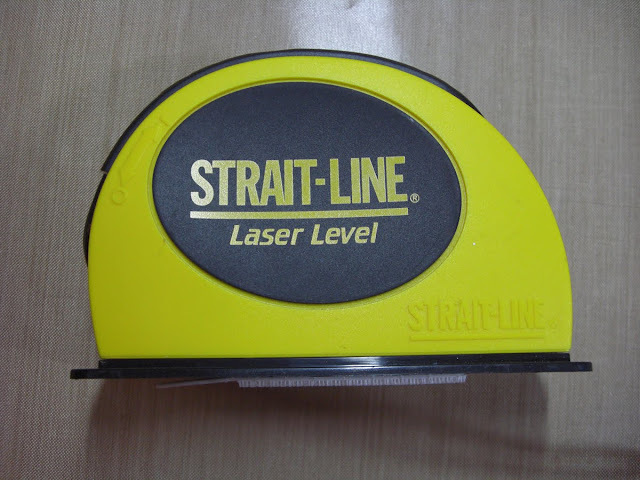 I took one of these strips and attached it to the base of my laser level. I then took another strip and inverted it so that the two Velcro like sides are touching. 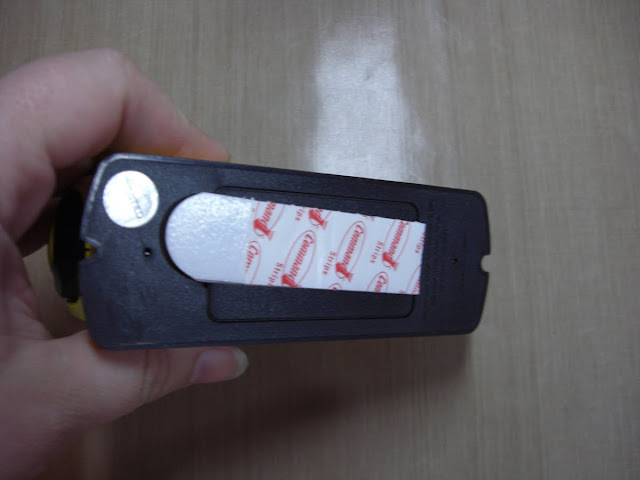 When you push the strips together they kind of lock into place, and you can actually hear a snapping sound. I then removed the protective paper off the strip and took it to the wall. I used the level to make sure it was straight, and when it was I just pushed the laser level to the wall and applied some pressure to make sure I got some good adhesion. The laser level stayed perfectly in place! I then turned on the light and proceeded with applying the vinyl. Another tip, when you are done only remove the strip from the wall. The strip that is on the laser level can be re-used over and over, so there is no need to remove it. 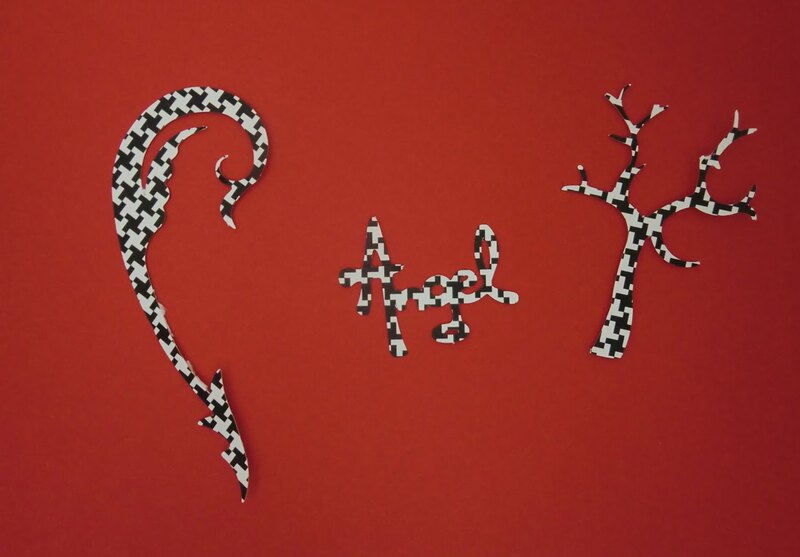 This picture only shows part of the wall art piece. I still have more to do on it, but I will share it when I am done. Thanks for stopping by and if you are new to my blog, you can sign up for the GIVEAWAY here! I am getting there! I definitely like this layout better than the one that I posted previously. By doing these layouts as I learn, it is also forcing me to catch up on my scrapbooking. This layout is for Jared's first Christmas and he is entering Kindergarten in less than two weeks so that tells you how far behind I am. When he was born, I gave up my scrap room for the nursery so every time I thought about working on my scrapbook, I would have to drag everything out to the kitchen table. Just thinking about that makes me tired! 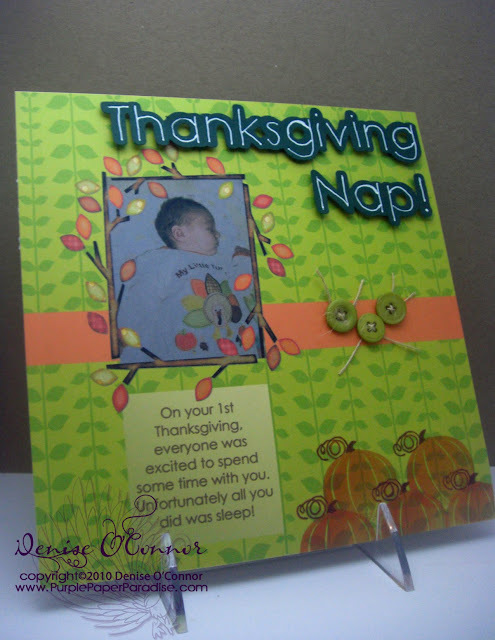 So needless to say, I did not do a lot of scrapbooking, I would do more cards. I now use a room that was once a home office. Since we got laptops, we decided that we really didn't need a dedicated home office so now it is my scrap room. 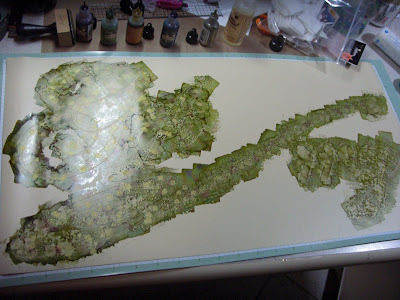 Enough rambling, back to the layout! With this layout, I was working on getting more familiar with layers and also with shadows. This is getting some more definition in the layout that was lacking in my last attempt. I am definitely making headway. I will be working on putting some video tutorials on how to use layers and shadows as well as several other things that I am getting the hang of. 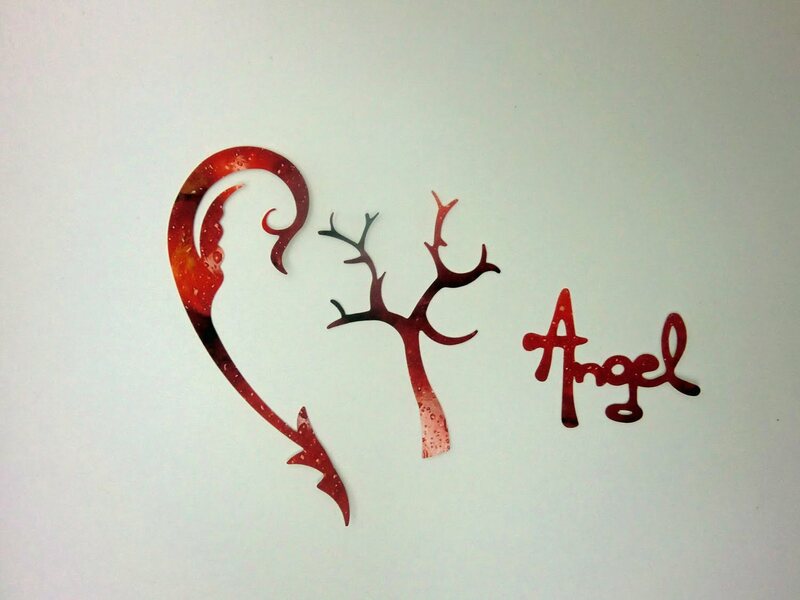 On this layout I used digital papers from Lettering Delights from the Elf Dance and Reindeer Dance paper packs. The font for the title is also from Lettering Delights and is called Kris Kringle. The Santa Claus image is a digital stamp from Doodle Dragon Studios (aka Dustin Pike). I love his work! The ribbon was from Michael's and the button is Papertrey Ink Pure Poppy buttons. Here is the link to my GIVEAWAY Post! A New Favorite Stamp Set?!?! It is always hard for me to determine my absolute favorite anything. There are just so many options, how can I possibly choose! I don't know if this is my favorite, but it would have to be in my top 10! I will be making some more things from this set, because there are so many gorgeous images in this set to explore! The stamp set is from Gina K Designs and it is called Pretty as a Peacock! 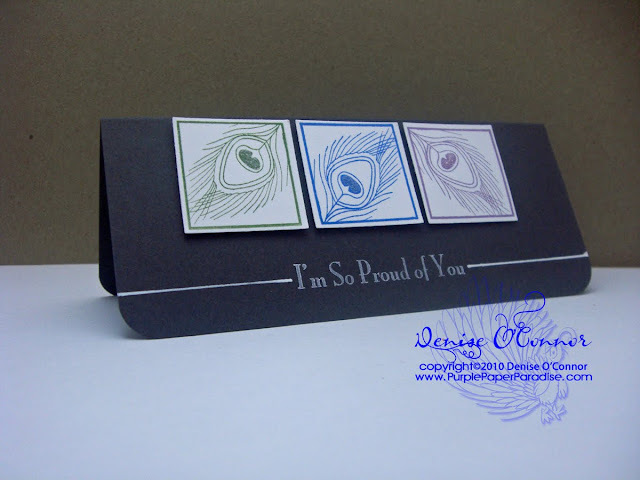 I stamped the square image showing the peacock feather tip in three colors (Papertrey Ink New Leaf, Memento Danube Blue, and Memento Sweet Plum) on white cardstock. I used a 1-1/2" square punch to punch out the images. I added a little glue from my glue pen to the center of the feathers and added a little glitter for some shimmer. The card base is Papertrey Ink Smokey Shadow. 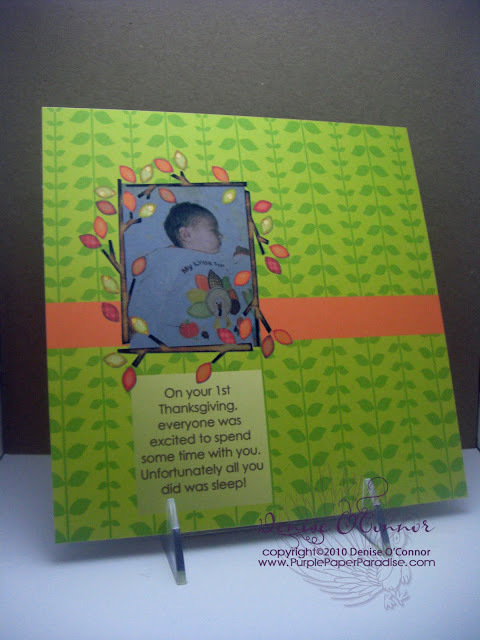 I used my corner rounder to round all four corners of the card base. I stamped the sentiment (also from Pretty as a Peacock) directly on the card base using Papertrey Ink Fresh Snow ink. I then took my ruler and lined it up and using my Signo white pen drew the lines on either side of the sentiment. Another reason why I love this card so much is because it is clean and simple. Whenever another crafter asks me for advice on making cards, I always tell them to keep it simple. Don't be afraid of empty space. The empty space will draw your eye to your focal point. 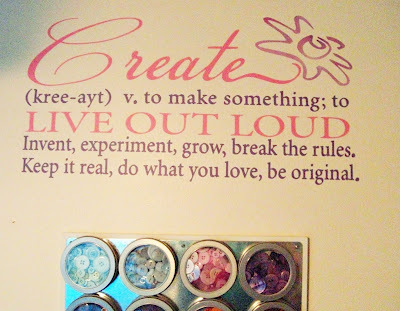 There are a lot of crafters out there that pile on the embellishments to the point where it is just too busy. Whenever I make a card and realize that I don't like it, often the problem is that I added too much. So keep that in mind, especially the next time you are struggling with a card! Thanks for stopping by! If you are new to my blog, don't forget to go to this POST to sign up for my giveaway. I have to tell all of you that I have added a few goodies that I did not share with all of you before, and I can't wait to announce a winner! Just a quick post today as I had a insane day yesterday, getting everything ready for my son to start kindergarten and I am not done yet! I have NOT received any tracking information on my eCraft, so unfortunately I don't think I will get it this week. I think that Craftwell has underestimated how long it can take for things to go through Customs, and how long it would take for them to get these machines shipped to the stores. I will update you all when I have an actual tracking number, and then I will hunt down the Postman/UPS Guy/FedEx Guy until I have my machine! LOL! I read a very interesting post over at Clever Someday. 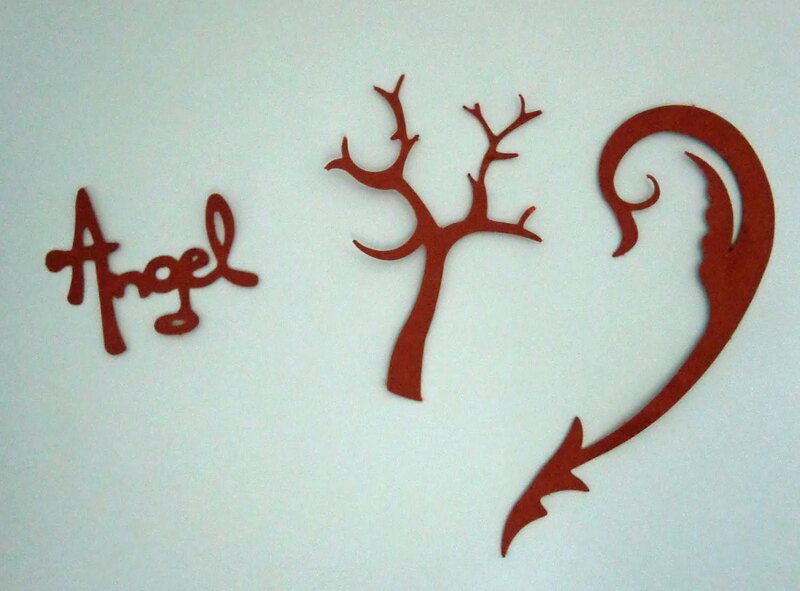 Kay has really put a lot of work into getting all the information about the Cricut Imagine and it is worth it. If you are even remotely thinking about getting a Cricut Imagine, go read THIS post, as Kay goes through all the positives and negatives of the machine. Stop by tomorrow, because I have a gorgeous card to share with all of you using a stamp set that screamed at me to buy it! Have a great day! Well I have been working my way through the book written by Patty Debowski found at TheDigitalScrapbookTeacher.com and thought I would share with you what I have accomplished so far. I am not completely happy with this yet, but I am getting there. I definately see the potential in hybrid scrapbooking, and I am having fun learning all of this. I have some more things to share with you, but I really need to feel more comfortable with it. I don't want to share something with you, only to find out later that there is a better way or something. First I am going to share with you the digital part of the layout. And here is the layout after I added some traditional embellishments. If you are a more experienced digital scrapbooker, I would appreciate any feedback you may have to offer. Thanks for stopping by today, and be sure to sign up for the GIVEAWAY! Yesterday, I had to go to the dentist, and I ended up being there for 2 1/2 hours. On top of that it takes me about 45 minutes to get there, and then 45 minutes to get back, so 4 hours total. 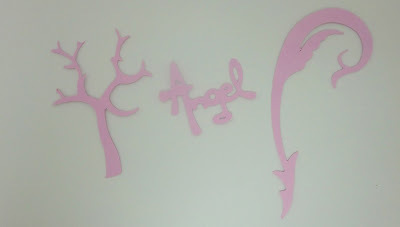 Unfortunately this took up all of my crafting time! I probably could have snuck in some time after I put the kids to bed, but I was not feeling great, so I went to bed and didn't get the project that I was hoping to post today done. This morning when I woke up (really early!) I realized though that I never posted this tip, so here it is. When I posted my peacock HERE, someone had asked me how I used the drywall tape, so I took these pictures to show everyone. First off, you can find drywall tape at any hardware store, and they come in a variety of sizes. I found this at Ace Hardware in the paint section. For this example, I used it to remove a bunch of small pieces off my mat that were the "negative" pieces, but the same technique can be done for "positive" pieces. Here is a before picture of the mat with all the pieces that I want to remove. 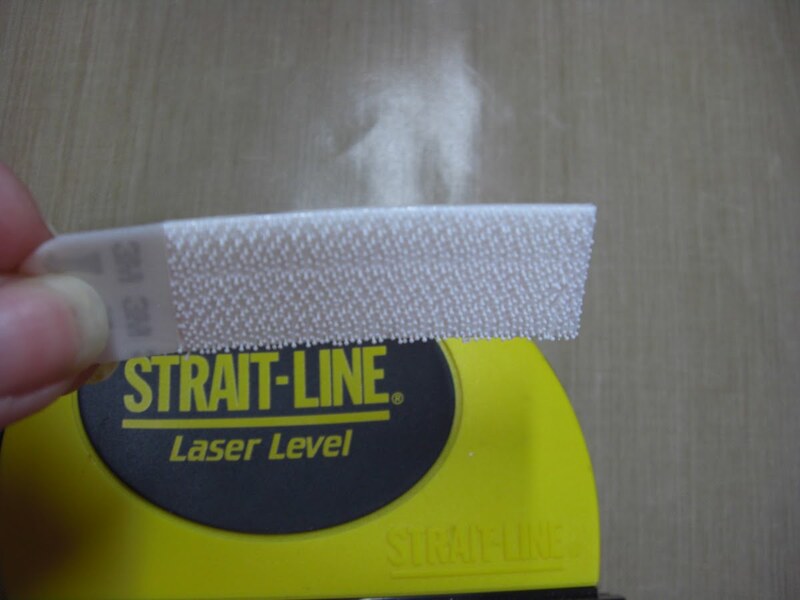 When you take the drywall tape off the roll, the sticky side is similar to the stickiness of your cutting mat. Go ahead and lay that on top of the pieces on your mat. Depending on what size tape you are using, you may need to overlap the pieces, like I did here. Now you are going to rub the tape and the pieces so that you can get the tape to adhere well to the pieces. When you start to remove the tape, make sure you have your spatula tool in hand. Start to peel back the tape, if there is a piece that is sticking to the mat rather than the tape, place the tape back over it and slide the spatula tool under the paper so that it lifts from the mat. Make sure that it is sticking well to the tape. I do this a lot when I have several pieces and I want to make sure that the placement is correct, so take your time if you need to. Once you are done this is what you will see when you flip the tape over. If these are the positive images that you want to use, at this point you can apply adhesive to your cut pieces and then flip the tape back over. Line up your cut pieces where you want them to go and put them in place. 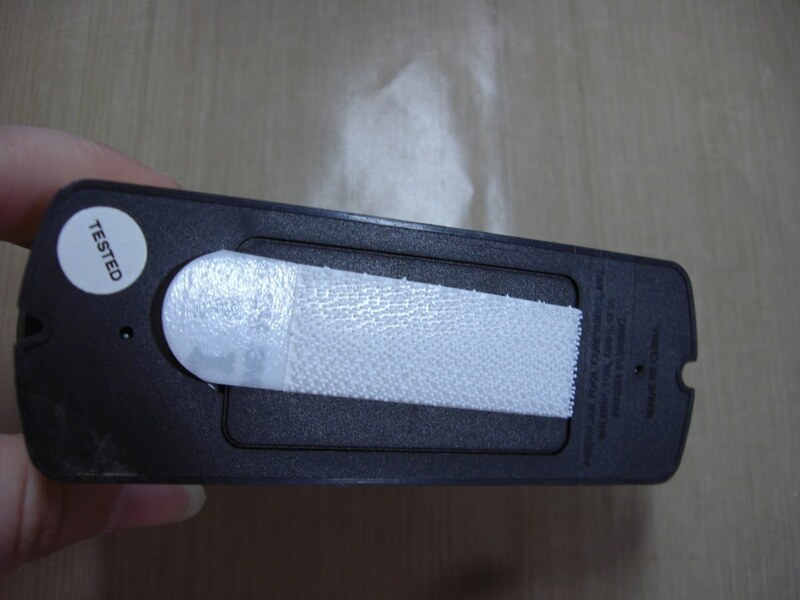 I usually wait a minute so that the adhesive can cure a little before trying the remove the tape. Slowly peel back the drywall tape, using the spatula tool if necessary to help the pieces release from the tape. And that is it! I have heard that this is similar to Magic Mesh, but I have never used that, so I cannot speak from experience. If you have any tips to share, I would love to hear them! Don't forget to sign up for the GIVEAWAY! Have a great day everybody and I will see you all tomorrow! It has been a crazy weekend around here and I have had very little crafting time! This will be a quick post today, because I do want to share some things with you. First off, an eCraft update. It looks like I could have my eCraft by Friday! YEAH! This isn't for sure yet, I will let you know once I have more concrete information. If I do get it on Friday, you can count on at least one video Saturday, with many more to come in the following days. The next thing that I wanted to share with you is that I have been invited to be a Hostess on a Blog Hop that is starting on Thursday, August 19th! I have a very cool challenge for all of you and a great prize to go with it. The themes for this Blog Hop is "Back to School" and "Fall". The hop will go on until the end of September. Be sure to check out these challenges, as there are some really fun and exciting challenges, and I can not wait to see what everyone comes up with! One more thing that is happening right now is that Papertrey Ink is showing some sneak peaks of their new products that will be released on August 15th. Nichole Heady one of the owners of Papertrey Ink is showing these sneak peaks on her blog, and starting on the 10th, she will be showing some projects created with the new products. Be sure to check it out! To kick start my journey on learning some digital scrapbooking techniques so that I can effectively do hybrid scrapbooking, I purchased a book by Patty Debowski at theDigitalScrapbookTeacher.com shown here. Let me tell you that this is one massive book. The whole book is filled with color photographs and contains a lot of information. If you would like to get your own copy, go to the link above. So far, I can tell you that the book is very easy to follow and does use real world English. There is always an explanation of what a technical word means before it is used so beginners should not feel intimidated. I am making my way through it, but I thought I would share something that I have learned and it has to do with organizing all your digital files, such as stamps, papers, etc. Before we get started, please note that I am using Photoshop Elements 8. I believe that most if not all of the features I will be discussing were in versions 6 and 7. I am not sure about versions before that. Today we are going to talk about the Organizer in Photoshop Elements (PSE) and how we can use this part of the program to search for the files we want by setting up tags. The best part of this is that once you find your file, we are just a few mouse clicks away from getting these files into the Editor part of PSE. PSE has a Organizer feature which I have used in the past for my photographs and love it because I can search using different Tags to find just the picture that I want. As you collect more and more pictures, it can become increasingly difficult to find that one picture, and the Organizer is just the ticket! This book suggested using the Organizer to organize your digital files as well which isn't something I had thought of before, but it works like a charm! To make it even better, there is an option to create a new catalog so that you don't have to mix these files with your photos unless you want to. 1. Go to the File menu on your menu bar and select Catalog. 2. The Catalog Manager window will appear, and you would select the New button. 3. Another window will appear and ask you for a name for your new catalog, enter a name and select OK.
2. The Catalog Manager window will appear, at the bottom of this window will be a list of all your catalogs. 3. Select the catalog that you wish to open, and click on the Open button. 1. Go to the File menu on the menu bar and select Get Photos and Videos. 2. Another menu will appear and you will select From Files and Folders. 3. You will then be able to select the folder where you have your items stored. 4. If you have a lot of files, like I do, and they are in different folders on your hard drive. Select one folder at a time and then organize as described below before bringing in more files. It will seem less daunting and much more manageable. 5. If after you have organized your files as described below, you decide to move the files, PSE will not be able to find them automatically. The best thing you can do is make sure your files are where you want them before organizing. If you must move your files, you will get a thumbnail on the main screen showing a "Broken Link", by clicking on this thumbnail you can tell PSE where you put the file. 6. If you should have a hard drive crash, as long as you have backed up your files after you have organized them as described below, the tags will stay with the files and will show up in PSE Organizer as Imported Keyword Tags. This is also helpful in case you have upgraded your PSE to a newer version. Now the cool thing about using PSE Organizer is the tags. Tags are a way of sorting your files the way you want them to. Tags are fully customizable to how you want them to be. Here is what you need to know so that you can decide how you want to organize your files. Tags come in Categories, Sub-Categories, and Keyword Tags. Sub-Categories can only be created as part of a Category. Keyword Tags can be created as part of a Category or as part of a Sub-Category. Here is an example of how I have organized some of my files. The Digi Stamp is a Category. The Activities, Alphas, and Animals are all Sub-Categories, and then Ant, Bear and so on down are Keyword Tags. The little arrows next to the Categories and Sub-Categories will either expand or collapse that category when you click on them with your mouse. What is the point of using the tags?...searching! For example if I want to see all the Digi Stamps that I have that have a bird in them, all I have to do is click in the box next to the Bird Keyword Tag so that it looks like this with the binoculars in the box. And this is what I see in the Main Window. It is now showing me all of the images that I placed the Bird tag on, so that all I have to do is scroll down to find the one that I want to use. Here is another way to search. In the search box, I typed in the word Orange and it selected ANY tag that has the word Orange in it and gave me this. And by scrolling down, you'll see that by searching this way, you'll see that this search is not limited to one category as seen here with some Digi Paper and Clip Art. So now, let's go over how to set up new tags. 1. In the Keyword Tags panel click on the green plus sign in the upper left corner as shown here. 2. Select the type of tag that you would like to create. If selecting a category tag, you will get this window. You will need to choose a color for your category as well as an Icon. 3. If setting up a Sub-Category or a Keyword Tag, you will need to specify what it's Parent Category is. The window will supply you with a list of all of your Categories and Sub-Categories. You can have a Sub-Category of a Sub-Category. You are now on your way to organizing these files. 4. Another way to set up Sub-Category tags and Keyword Tags, is to select the category so that it is grayed. Then do a right mouse click and a menu will appear with several options. This is also how you will Edit or Delete tags. 1. This is really simple. Using your mouse select one of your tags, click and drag it over to the thumbnail in the main window. 2. When you look at your files in the main window that have been tagged, you will see an icon in the lower right corner. In this picture, the icon is the green tag shape. When you hover your mouse over the icon it will tell you what tags are on this file. You can place as many tags on a file as you wish. 3. What if you need to remove a tag from a file? Easy. On the thumbnail of the file, do a right mouse click and select Remove Keyword Tag from the menu that appears. This option is towards the bottom of that menu. Another menu will appear showing all the keyword tags on that file, simply click on the one that you want to remove. Here are a few other hints when using the PSE Organizer. Under the menu bar just to the right of the middle of the screen, you will see this slider bar. This slider bar will allow you to adjust how many thumbnails you will see on the screen. The closer the slider is to the right, fewer images will appear but the thumbnails will be bigger. The more to the left the slider is will present you with more thumbnails but they will be smaller. Find the setting that works best for you, but don't be afraid to adjust this if you need to see an image closer to determine where it should go. When I started this process, I had about 6,000 images to sort through. There was no way that this was going to get done quickly, so it took me awhile. One thing that helped was viewing only the Untagged Images. To do that go to the Find menu on the menu bar and select Untagged Items. Another helpful hint is selecting several thumbnails at a time. There are two ways to do this. You can click on each thumbnail while holding down the CTRL key. The other way is for when you have several files in a row that you want to select. Press the SHIFT key and click on the first file in the list and then the last file. This will select all the files in between and including those two files. You will know that the files are selected because a blue box will appear around the thumbnail. Once you have all the files selected, you can attach your tags to them. This method was especially helpful when I was tagging my Alphabets from Lettering Delights. I could click on the A and then the 9 and all the letters and numbers were selected. 1. The first thing that I recommend that you do is set up your Watched Folder. Go to the File menu on the menu bar and select Watch Folders. A dialog box will appear, select Add and then select the folders where you store your digital files. When you have this set up, each time you open PSE Organizer the program will search those folders to see if there are any new files. It will show you a dialog box like this. 2. Click Yes. You will now get this window. This box will allow you to select which files you want to bring into the Organizer. I always say OK to everything. If you see duplicates there, like I have, don't worry about that. That just means that there are two versions of the file there, such as a JPG and PNG. Sometimes you will also get the designers logo or TOU files. 3. After you click OK, PSE will begin importing the files. Sometimes a message will pop up saying that some files could not be imported. Usually this means that there were some TOU files that were not in a format that PSE recognizes. Once it is finished importing you will get this dialog box which simply means that for the time being, it is ONLY showing the files that it just brought it. 4. Now you can tag your files however you wish. 5. If there are files that were imported that you don't want in your catalog, you can remove them. To do that, do a right mouse click on the thumbnail, and select Delete from Catalog. If you want to completely remove it from your hard drive, there is a checkbox on the dialog box that appears that if checked will delete the file from the hard drive as well as the catalog. As a default, this checkbox is unchecked so that it will not delete it from the hard drive. 1. Do your search to find the file that you want to bring into the Editor. 2. Once you have found your file, do a right mouse click on the thumbnail and select Edit with Photoshop Elements. 3. A loading dialog box will appear and then the Editor will open up and your file will be there ready to edit. 4. If you wish to use more than one file to create a layout, just go back to the Organizer and find your next file. Do the same process as above. Assuming that you did not close out the file or the Editor, you will now have both files available. Another thing to know is that you can bring in files from different catalogs into the Editor. To do that, bring in all the files that you want from one catalog and then go back to your Organizer. Follow the instructions listed above to switch catalogs and then select the catalog that you want. You can bring files in from that catalog and they will show up in the same Editor workspace as the other files. This can seem like a daunting process, so take your time to do it. Once it is done, it really will save a lot of time! I wish SVG files would work with this! The other thing that I discovered is that the more detailed you are the better your results are. Before you get started, take some time to think about how you want to set up your Categories, Sub-Categories, and Keyword Tags. This can make all the difference. I hope all of this made sense to everyone. I am sure that I probably left something out, so if you have questions, please let me know and I will answer them to the best of my ability. Thank you for reading this long, long post. I hope you got something out of it, and don't forget to sign up for my GIVEAWAY. Back to School Teacher Gift!